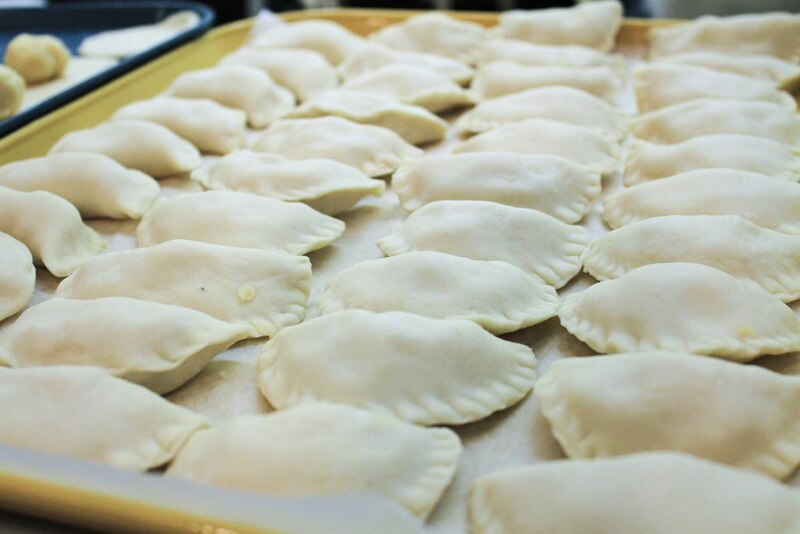 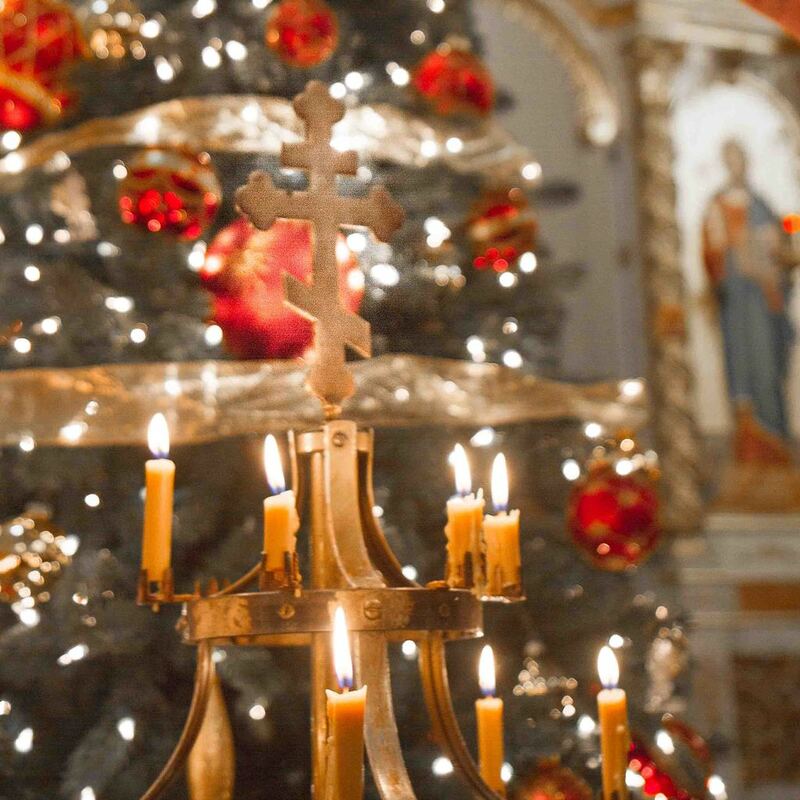 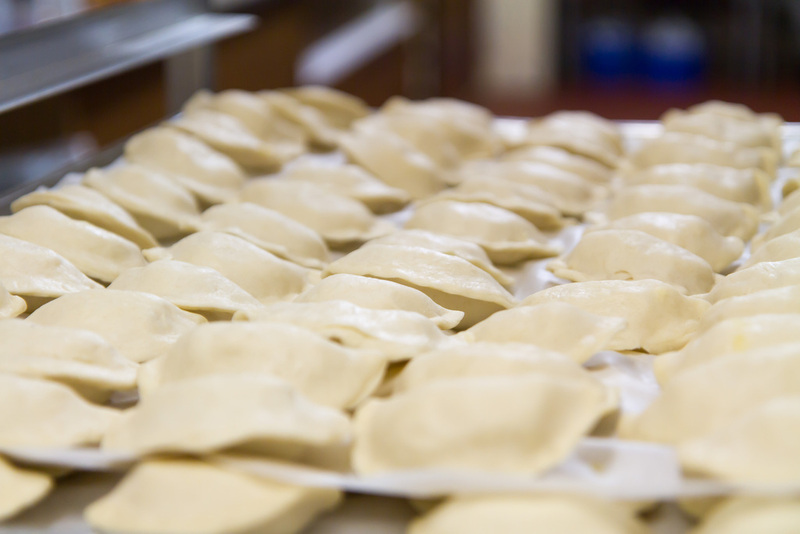 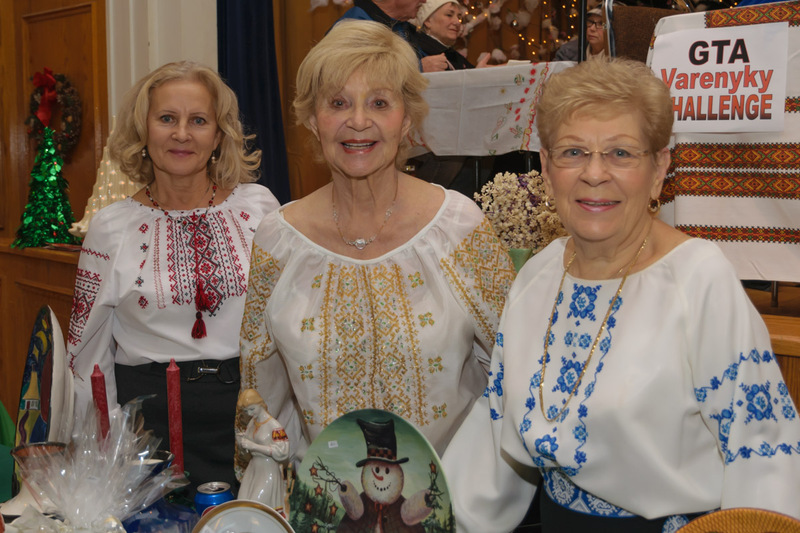 On Wednesday January 18th, Theophany Eve Vespers were held at St. Demetrius Ukrainian Orthodox Church, followed by the Parish Jordan Supper. 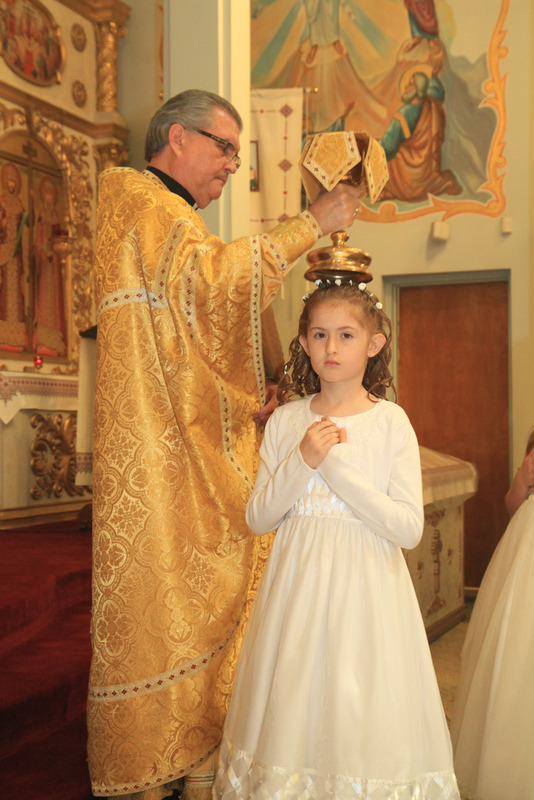 Congratulations to the young members of our church who partook in the Holy Sacrament of Confession for the first time on Saturday May 27, 2017, followed by the Sacrament of Holy Communion on Sunday. 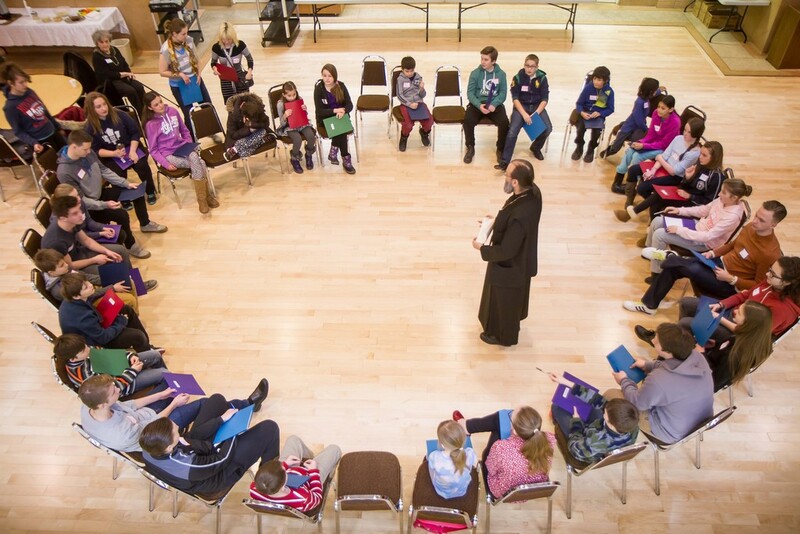 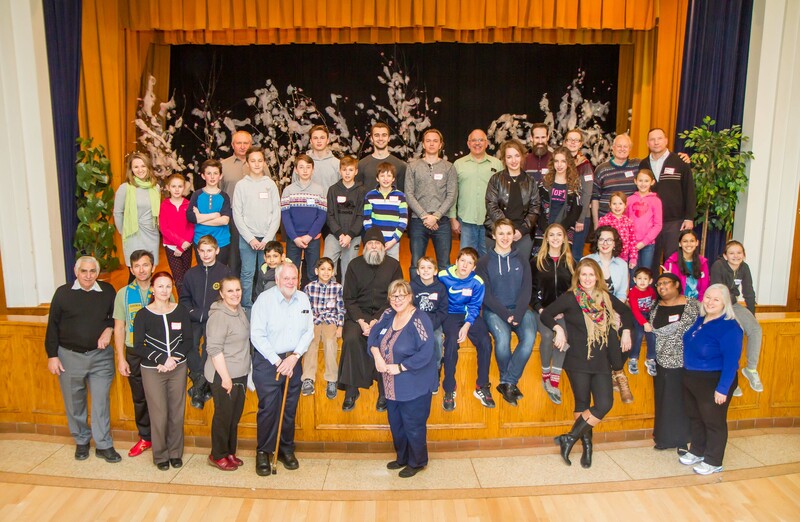 On Saturday March 4th, UOCC East held the Lenten Retreat for Youth and Family "Church in the Home" at St. Demetrius Ukrainian Orthodox Church. 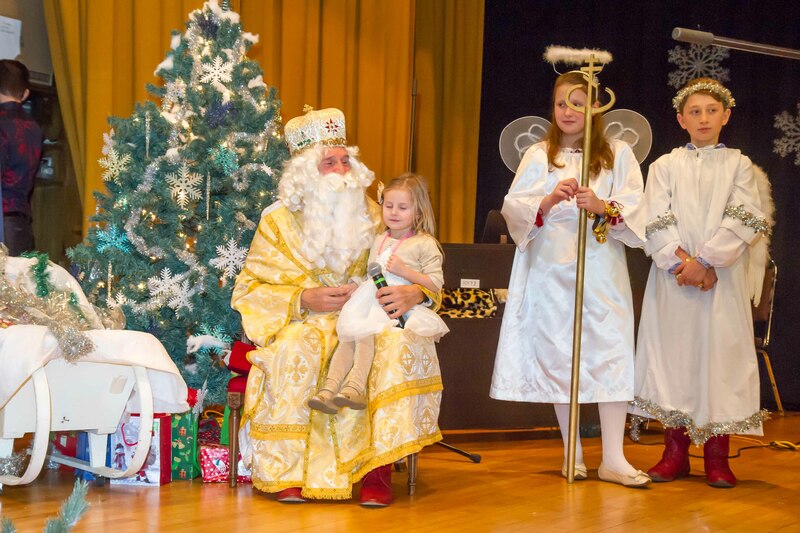 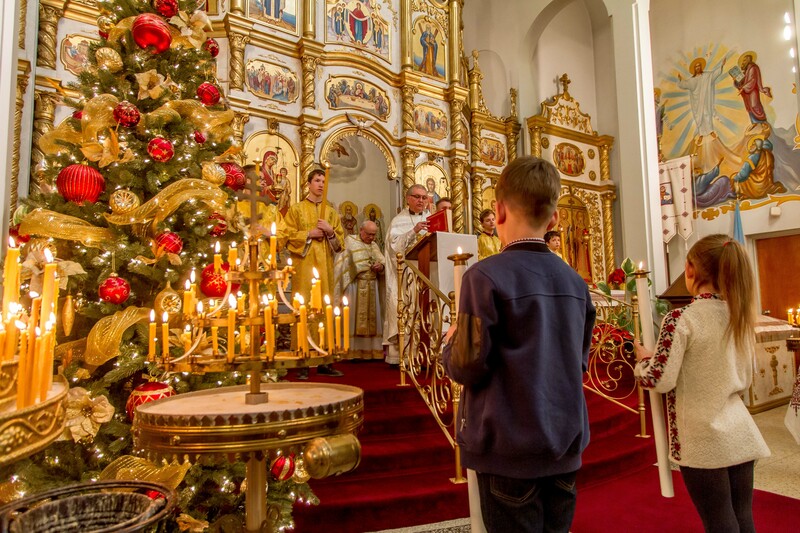 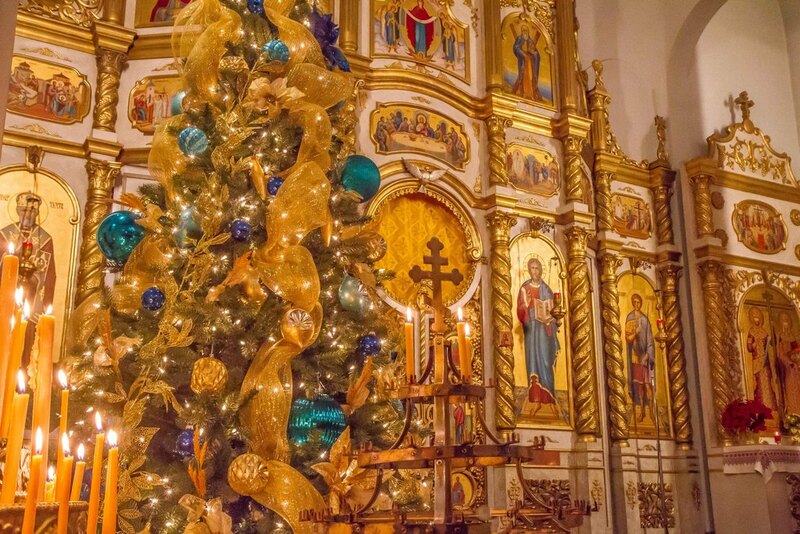 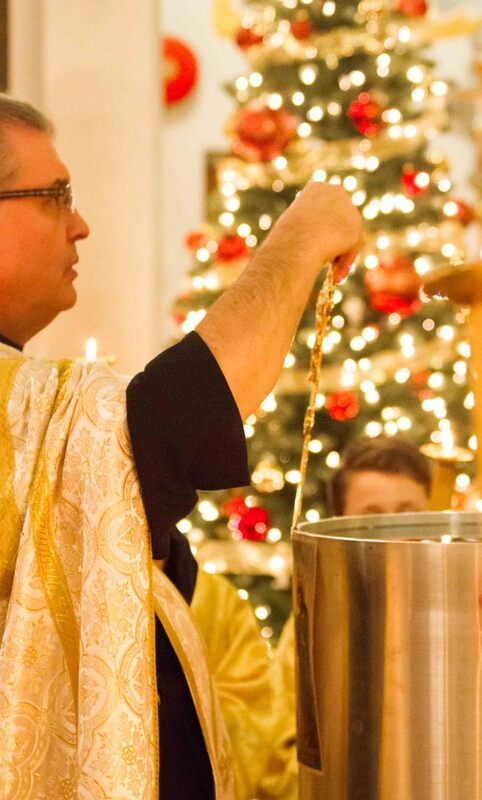 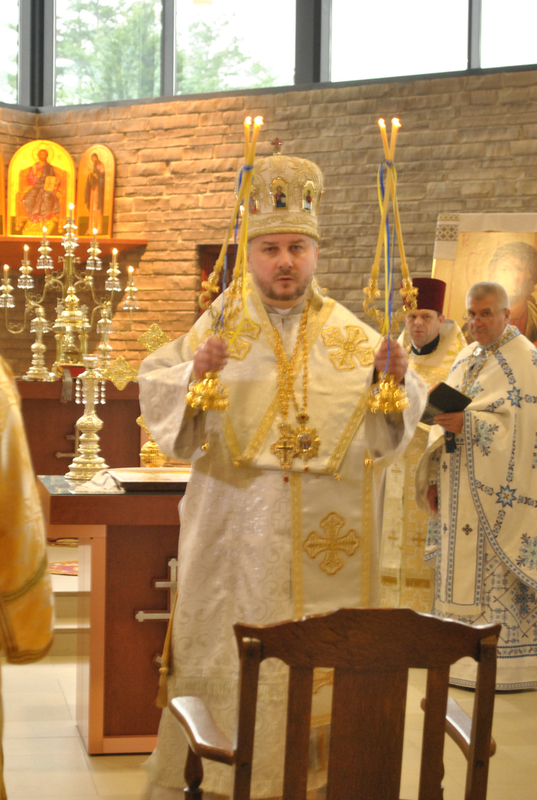 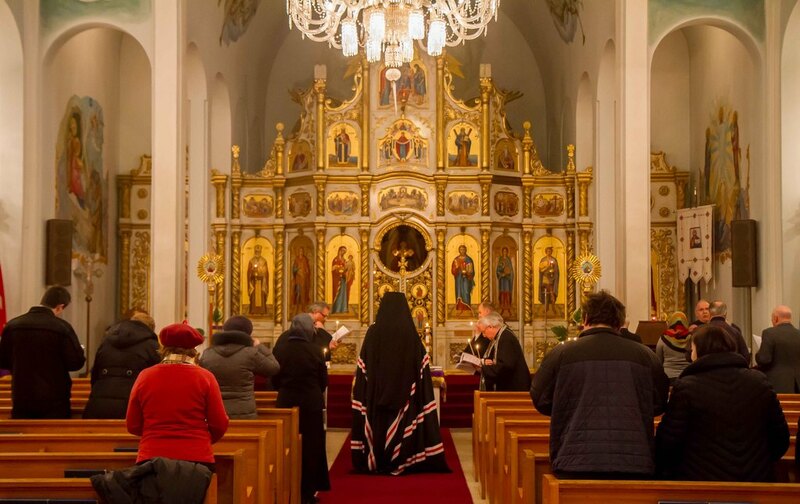 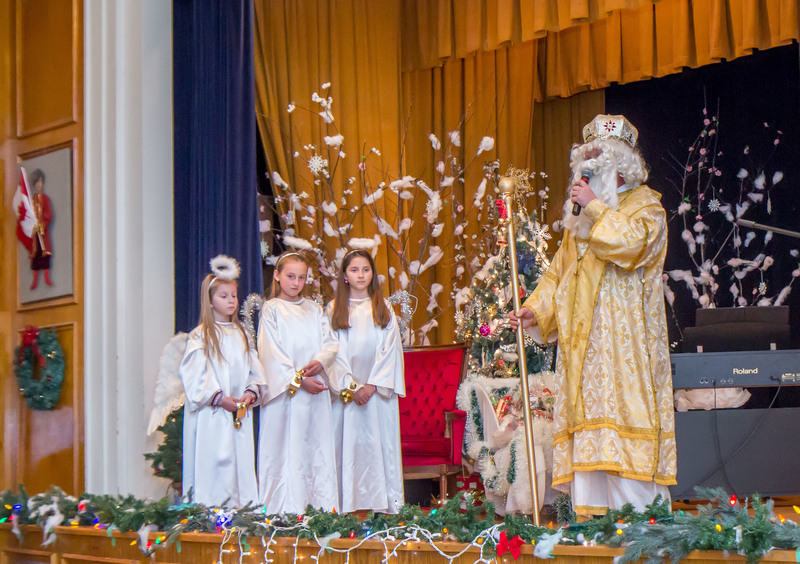 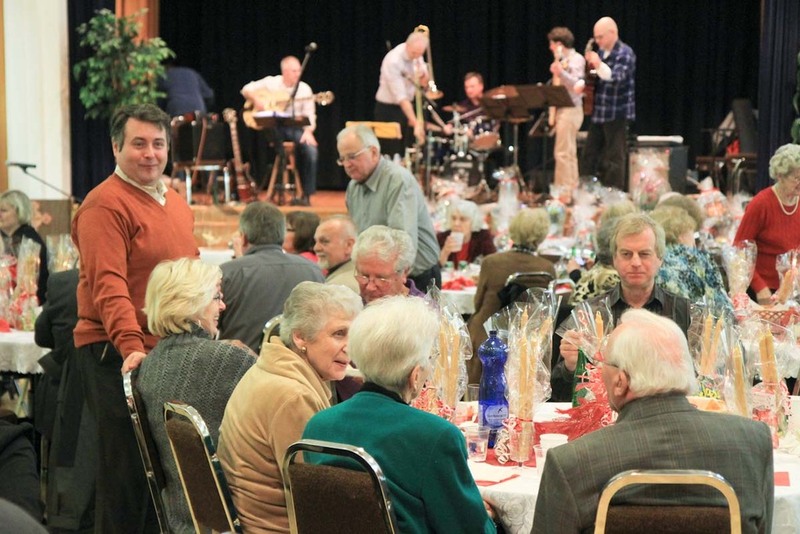 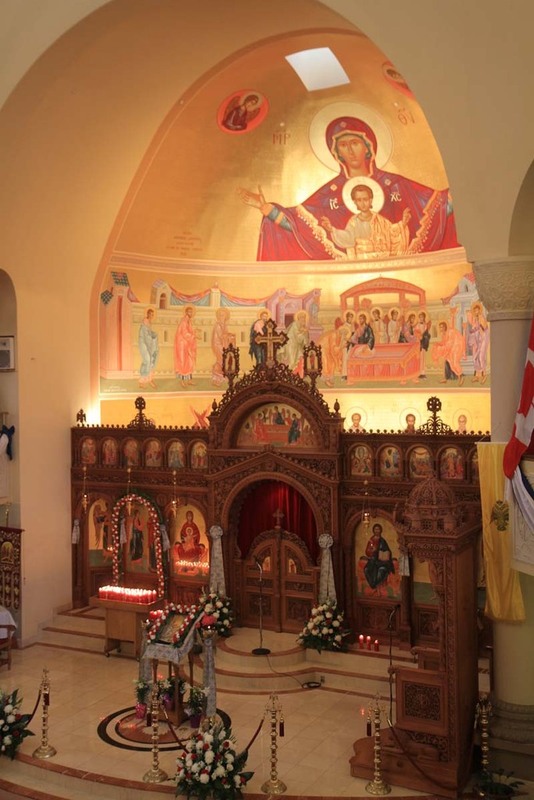 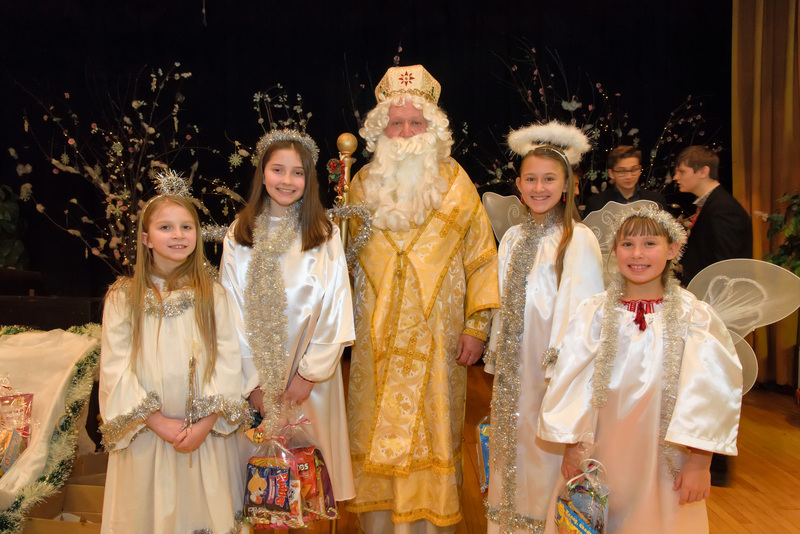 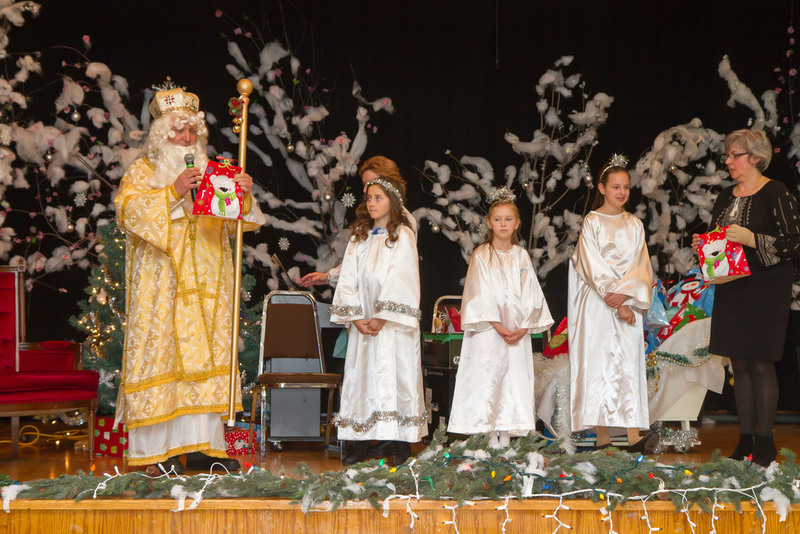 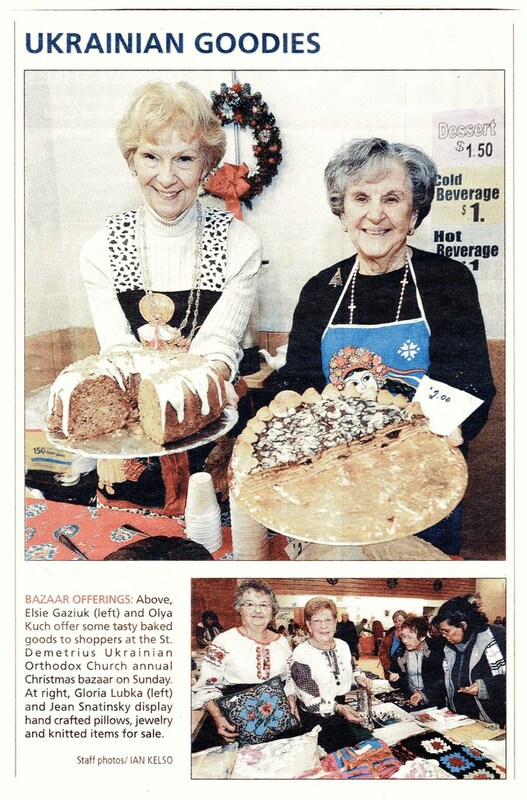 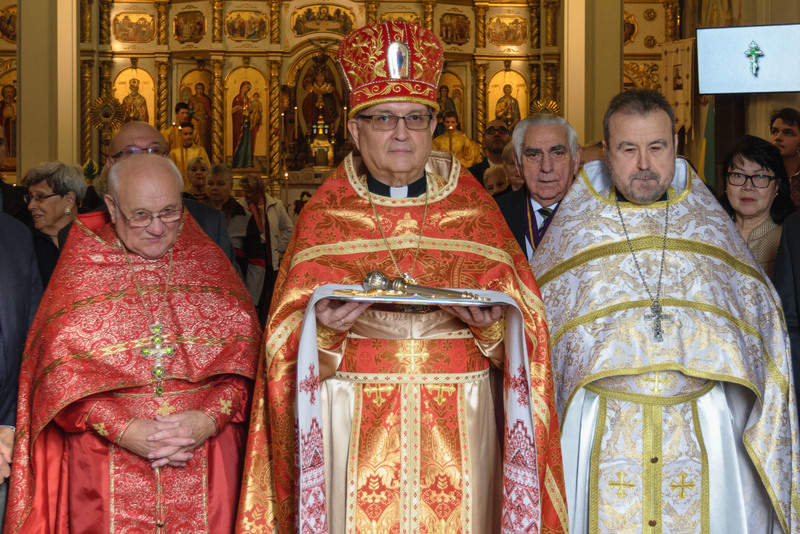 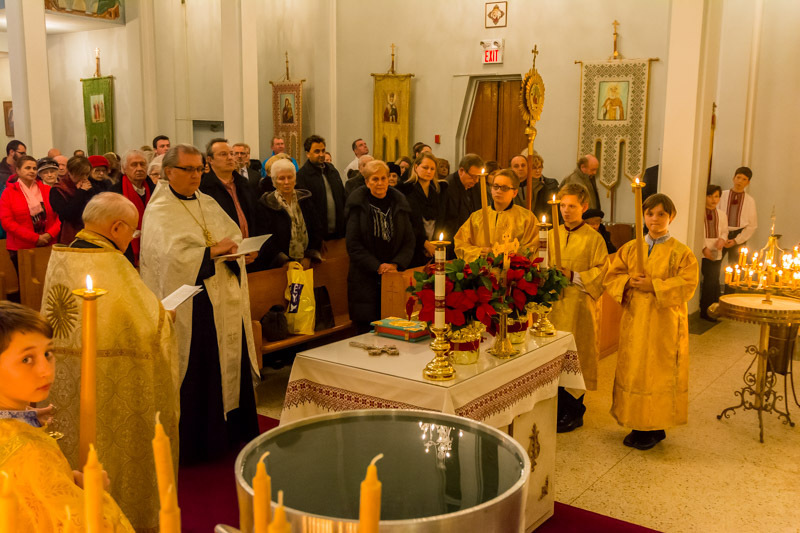 On Sunday December 18, St. Demetrius parish was visited by Sv. 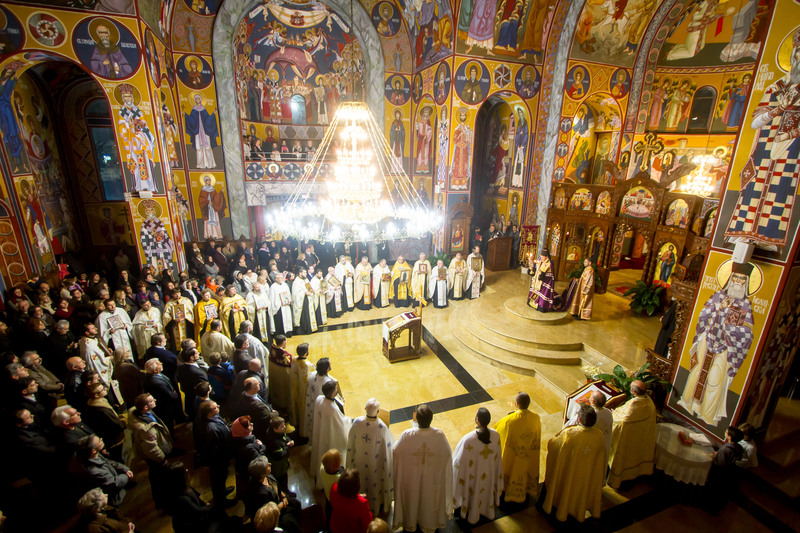 Mykolai (St. Nicholas). 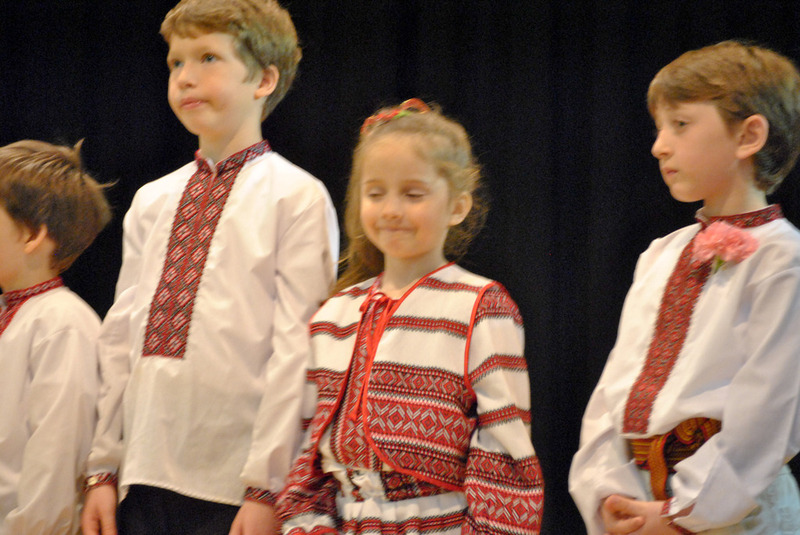 The children sang songs, recited verses, played on bandura and piano, all to welcome Sv. 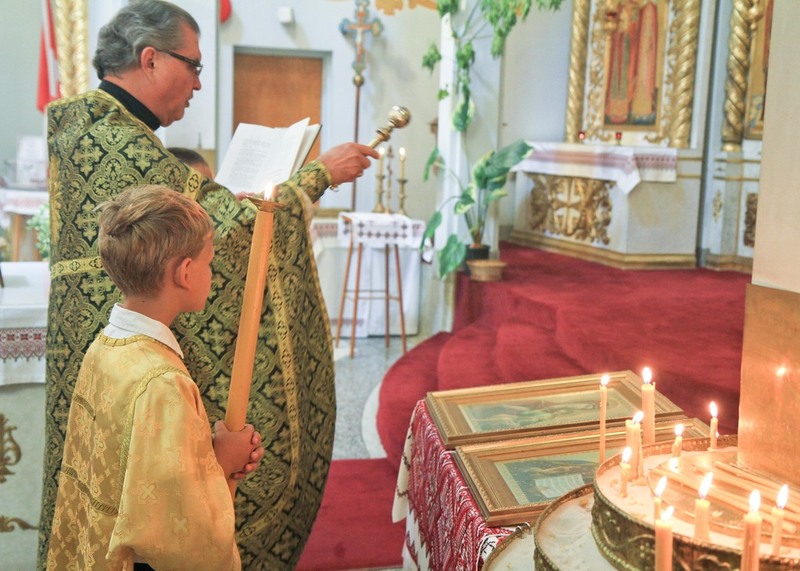 Mykolai to the parish! 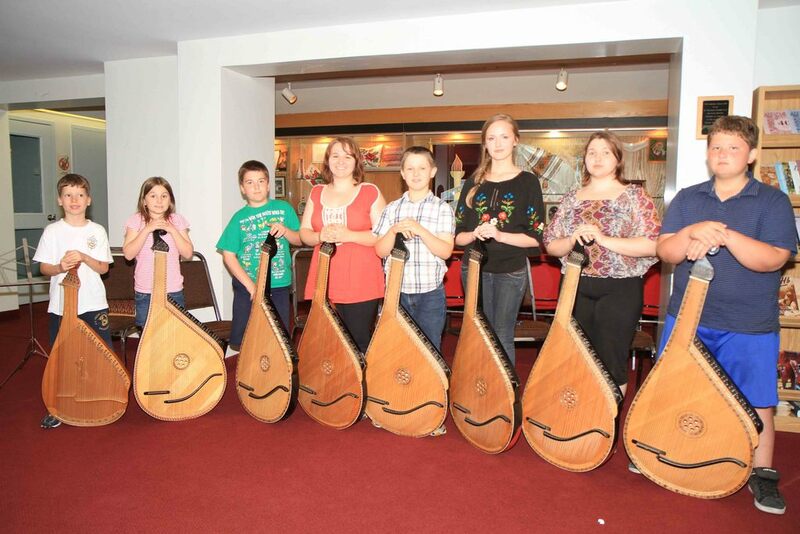 After the concert, the (good) childen were excited to receive a special gift from Sv. 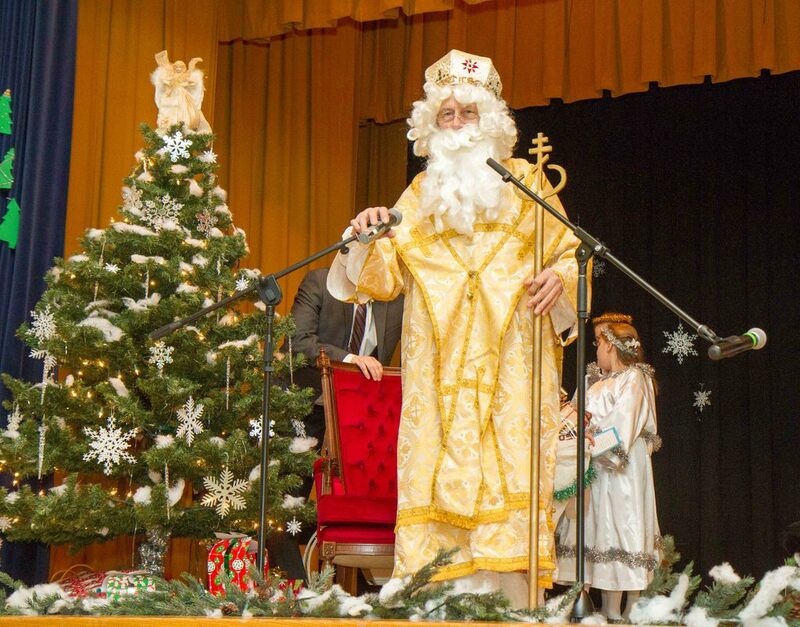 Mykolai! 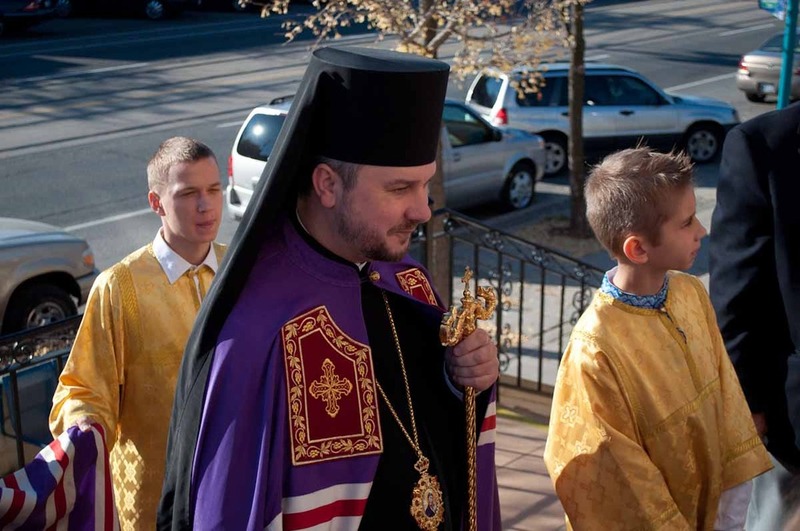 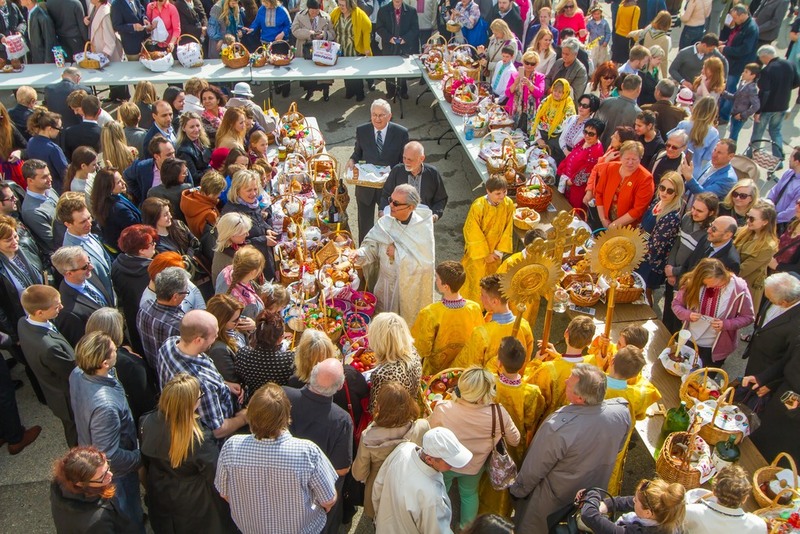 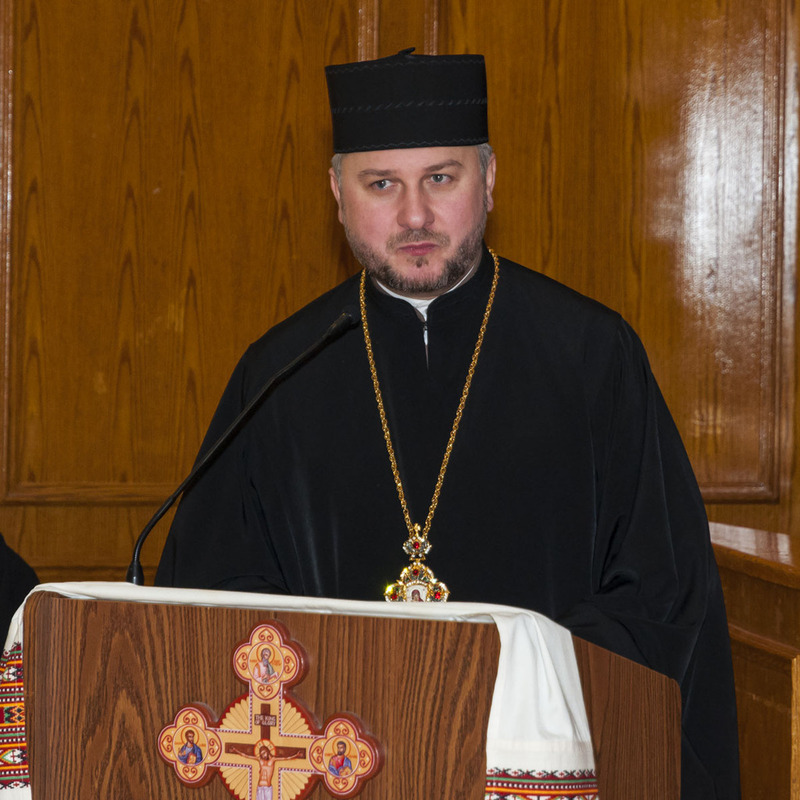 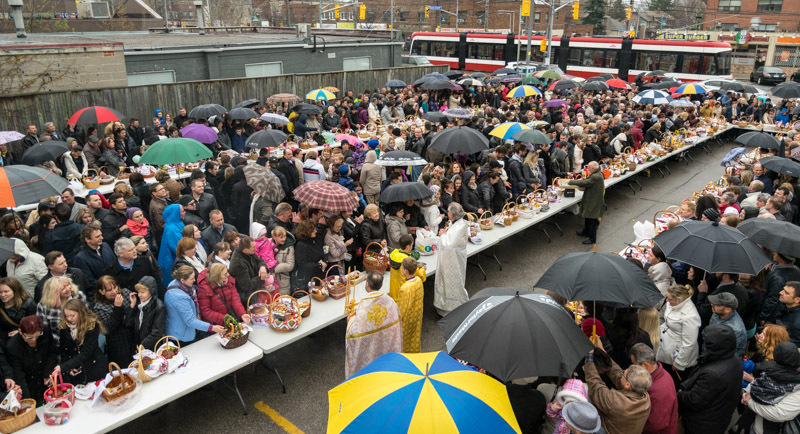 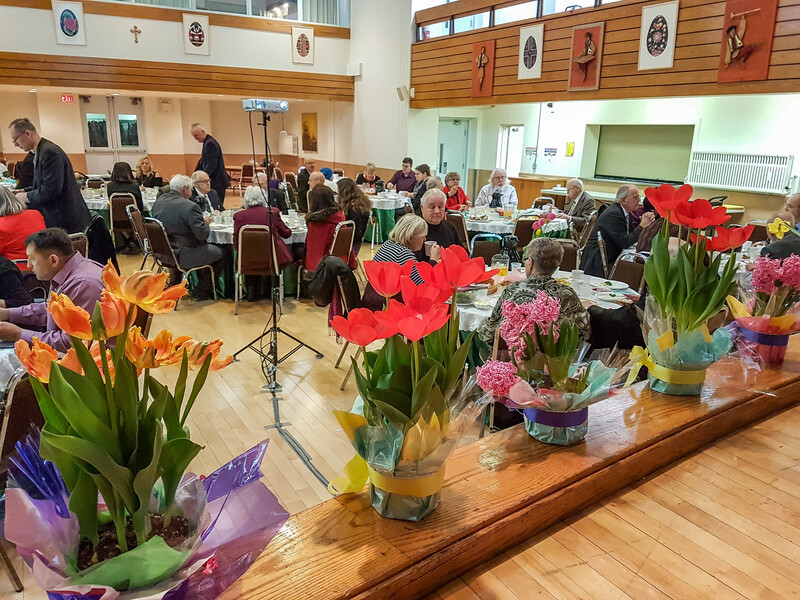 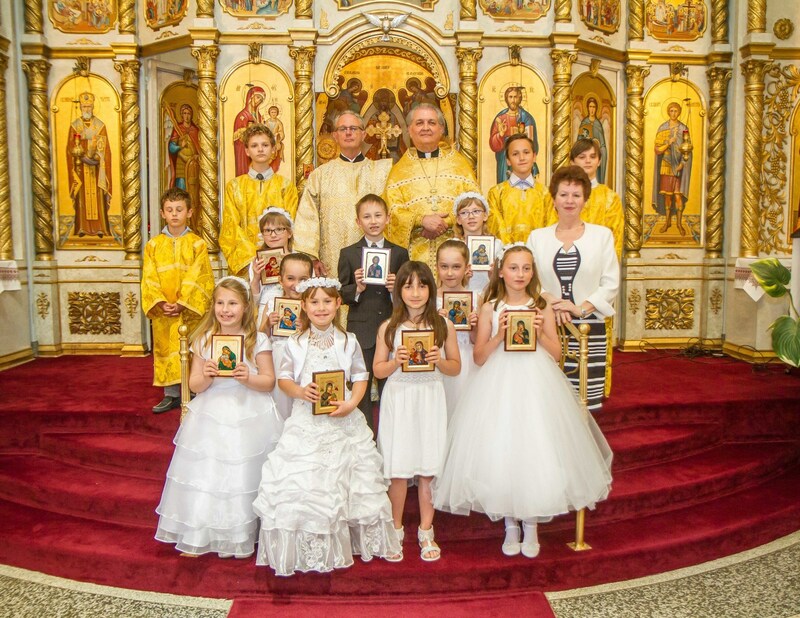 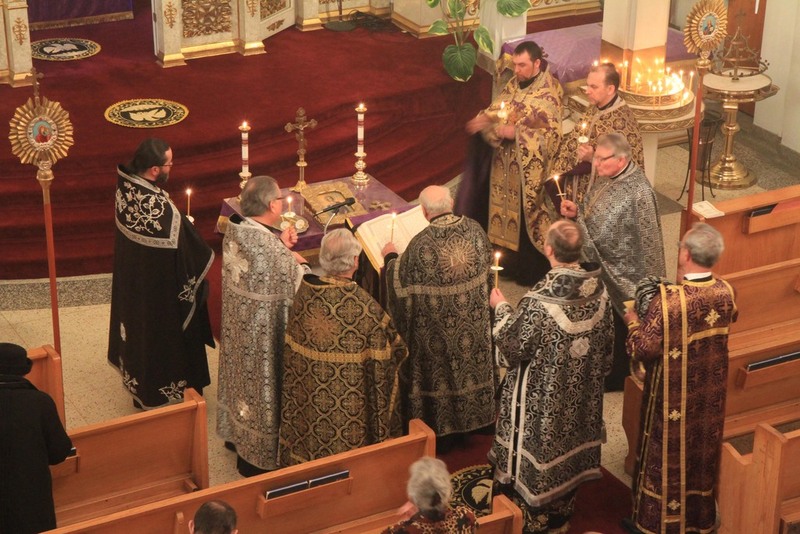 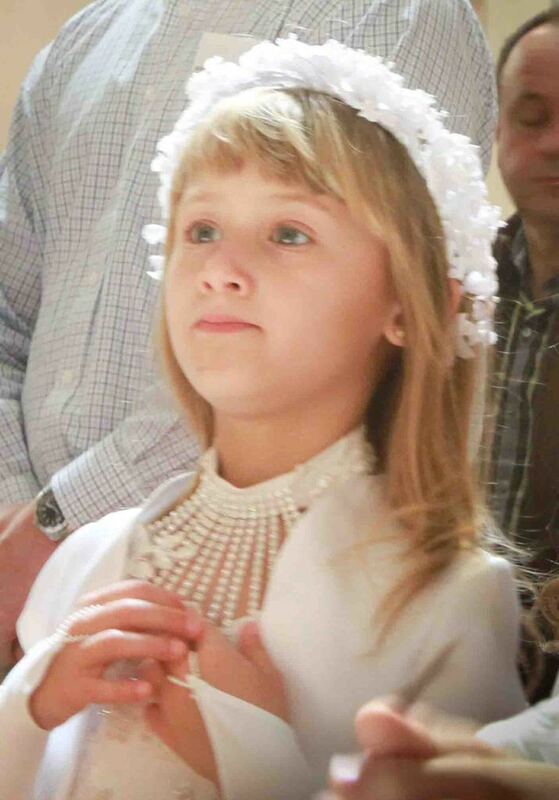 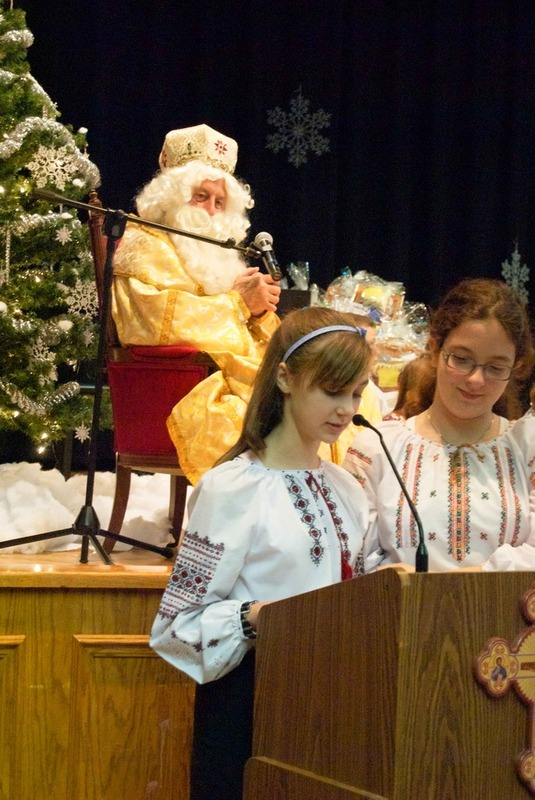 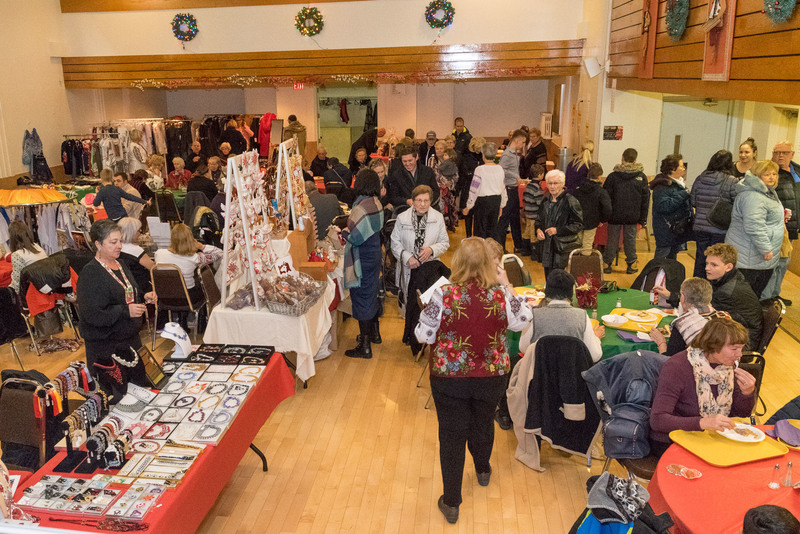 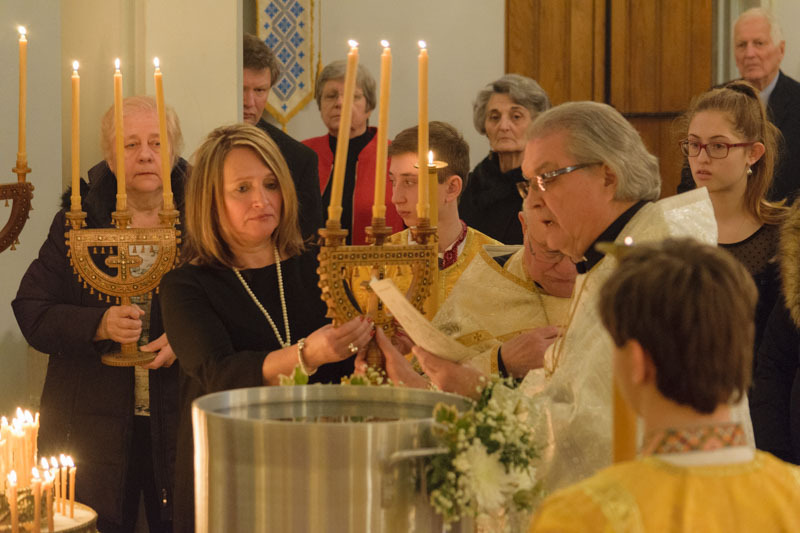 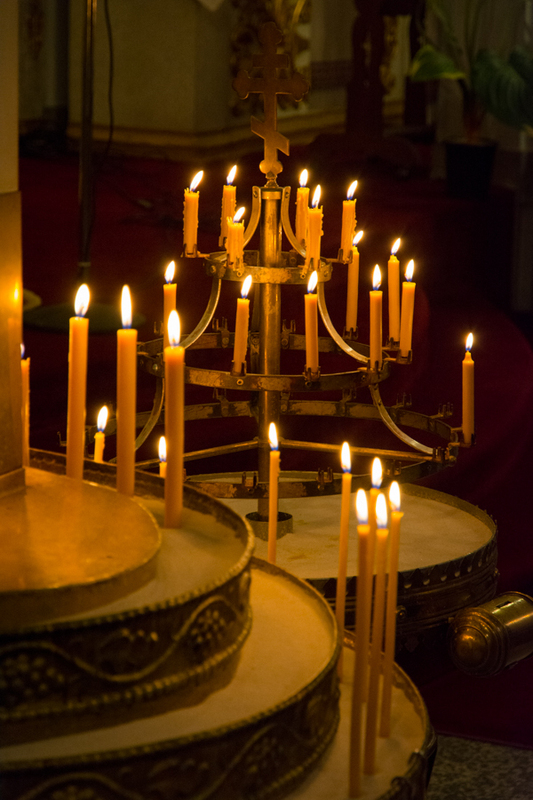 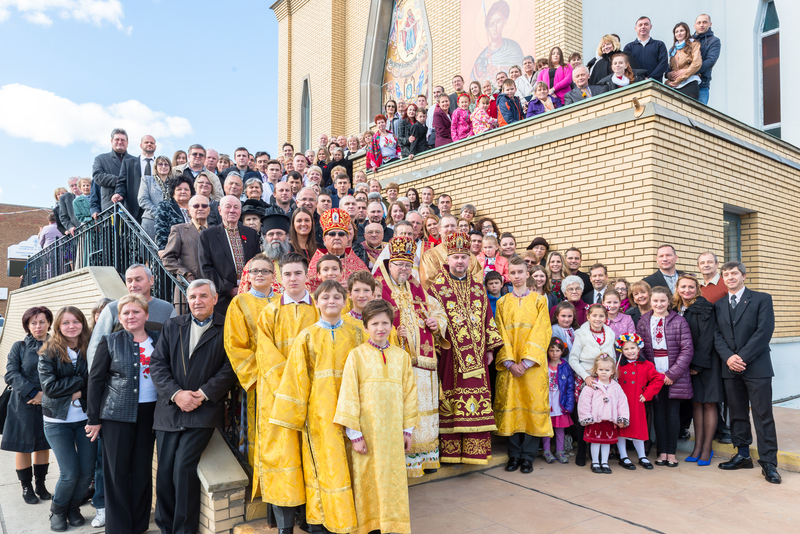 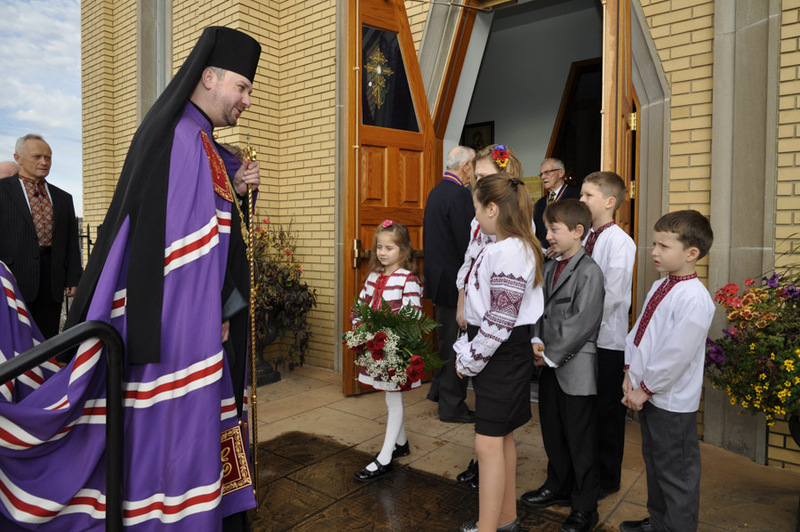 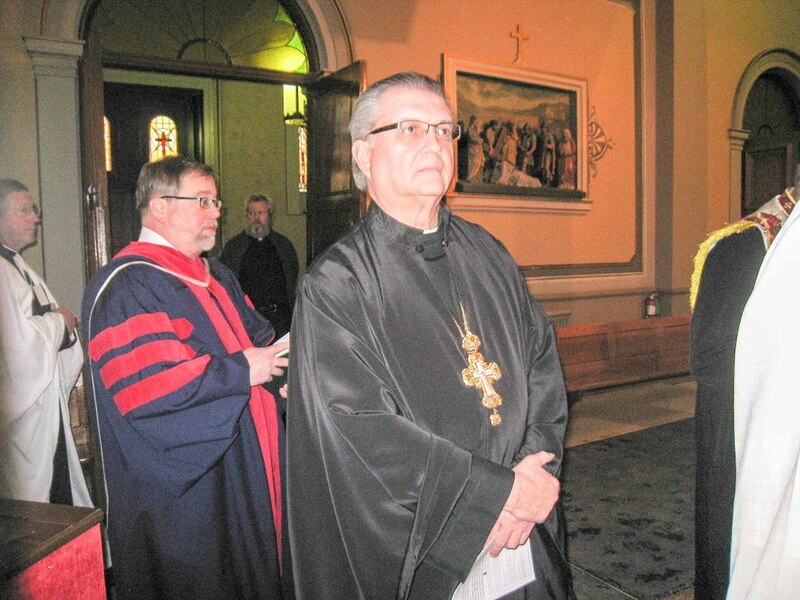 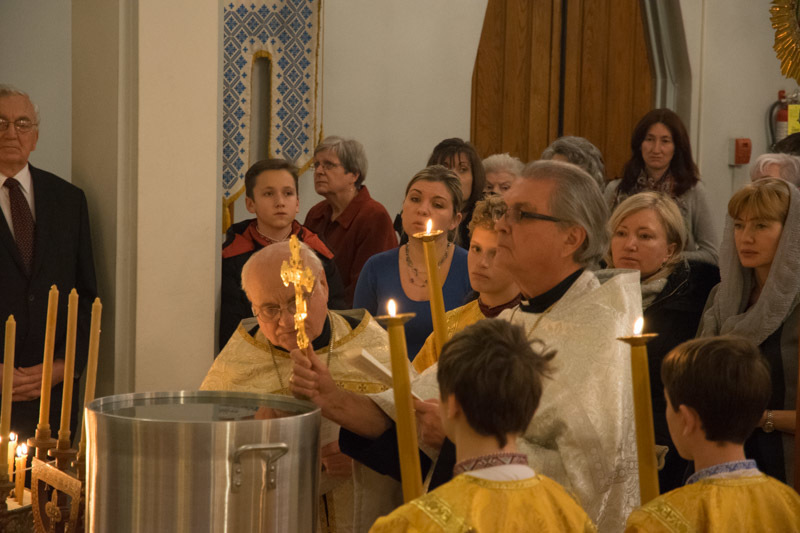 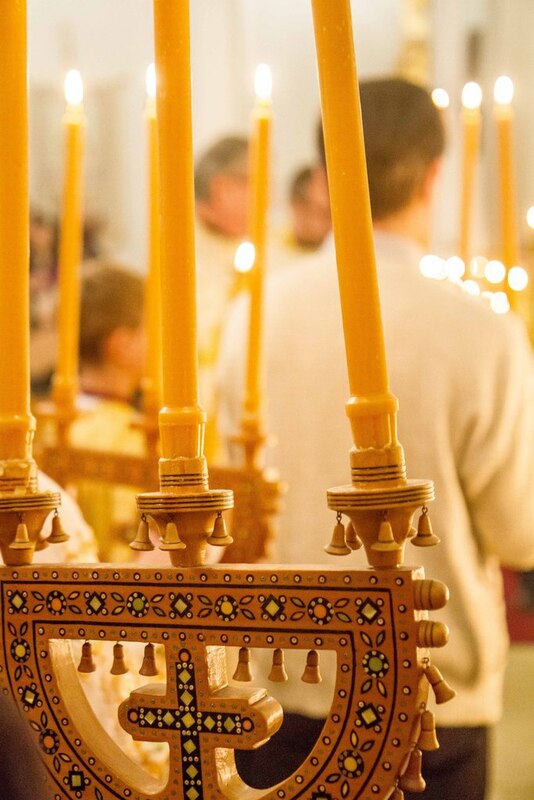 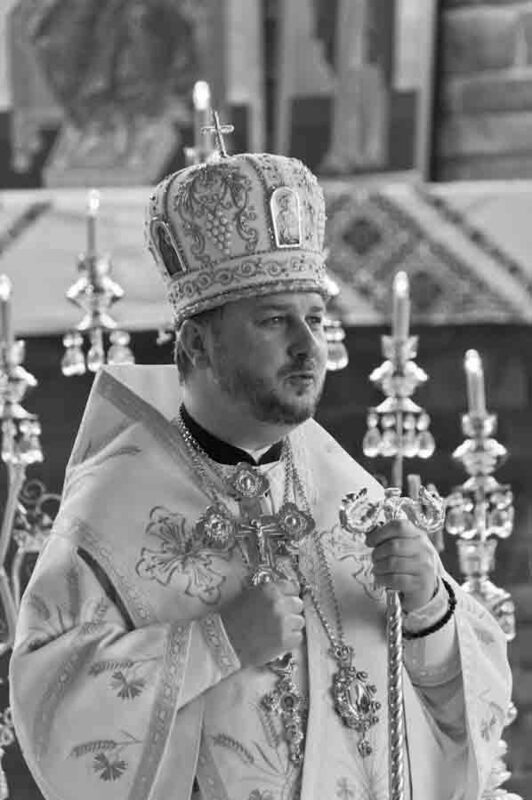 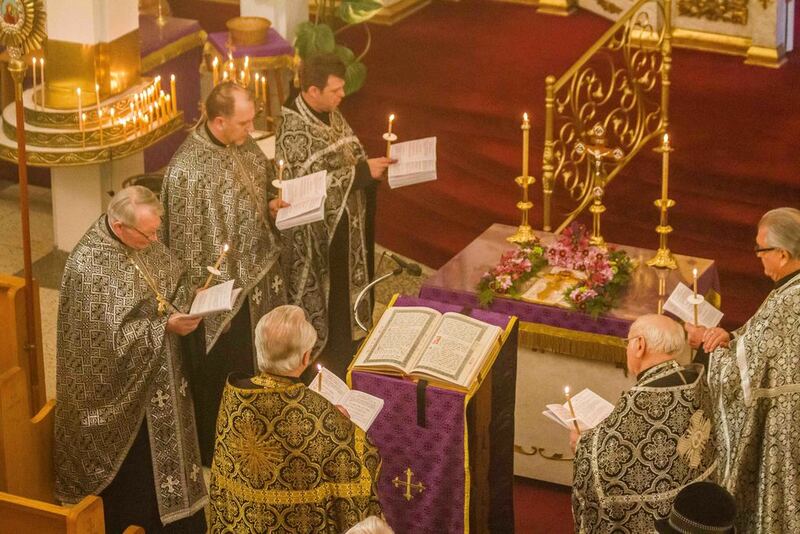 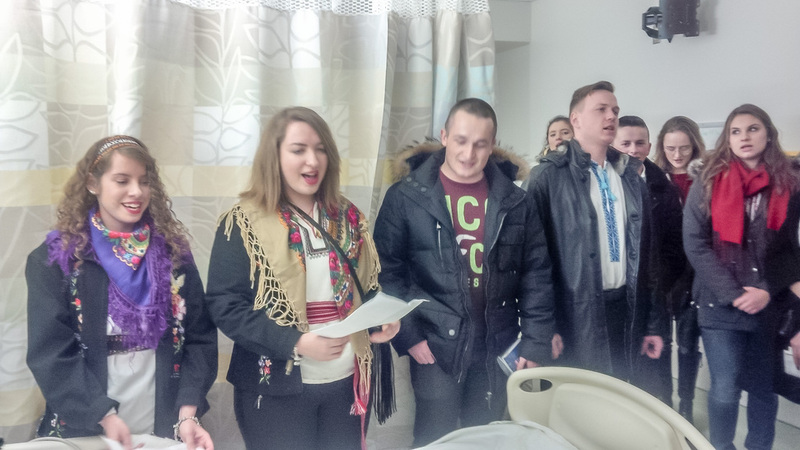 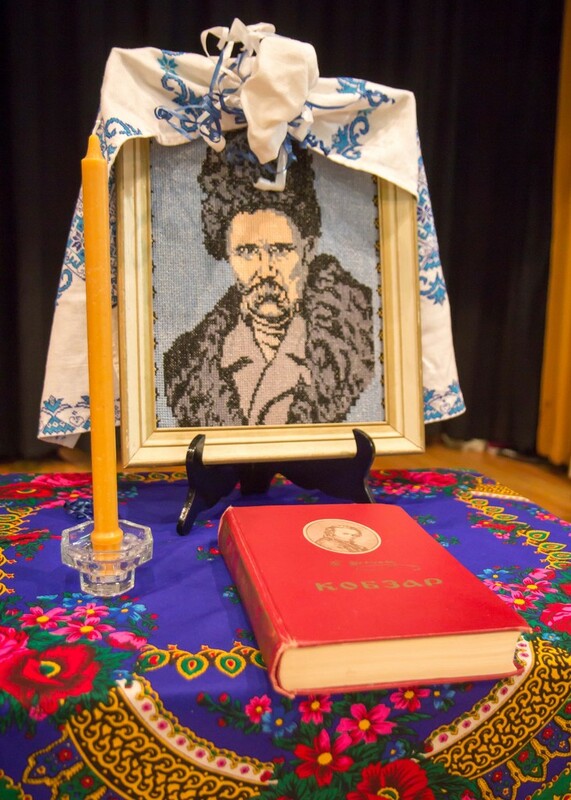 On Saturday November 26, On Saturday November 26, the Ukrainian Canadian Congress held a Panakhyda (Memorial Service) at St. Demetrius U.O.C. 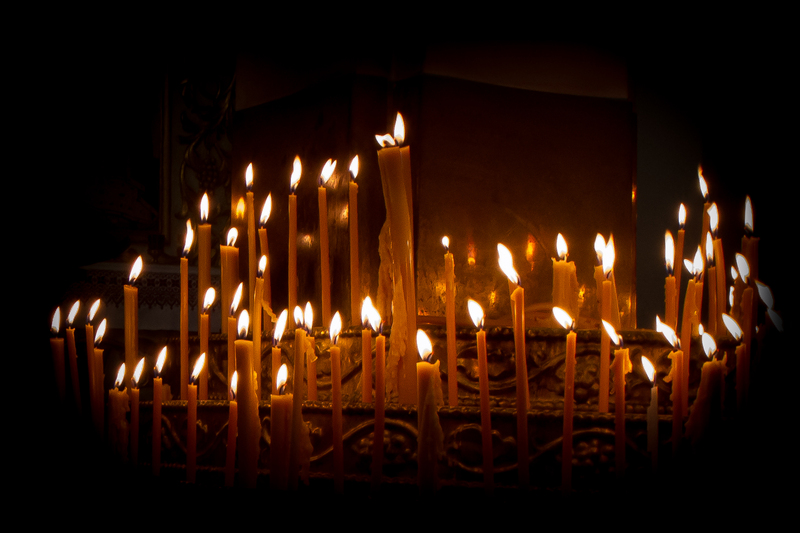 for the victims of the 1932-1933 Holodomor (Famine) in Ukraine. 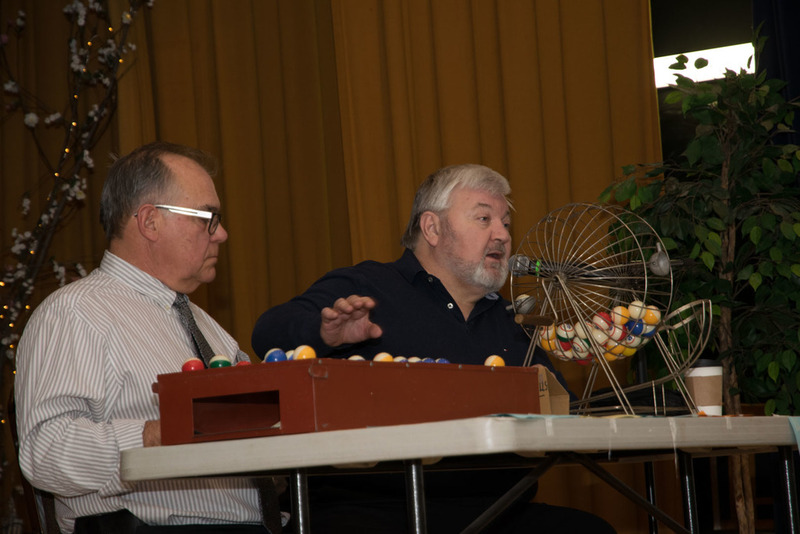 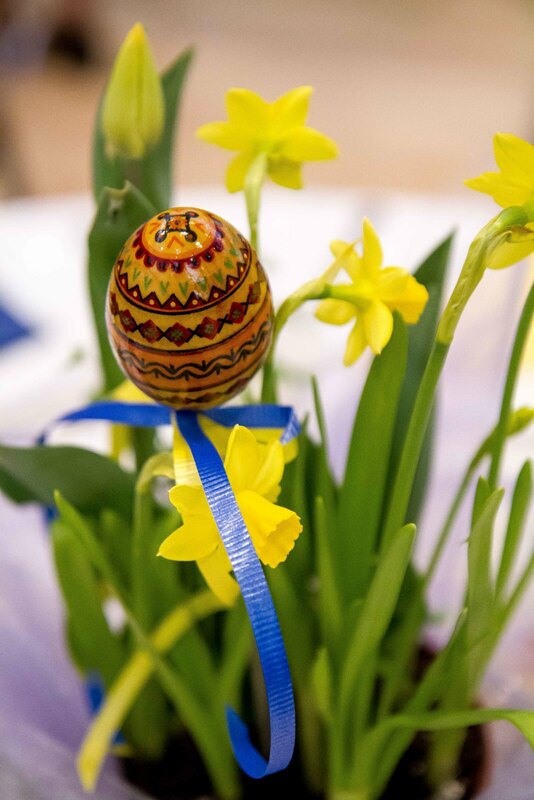 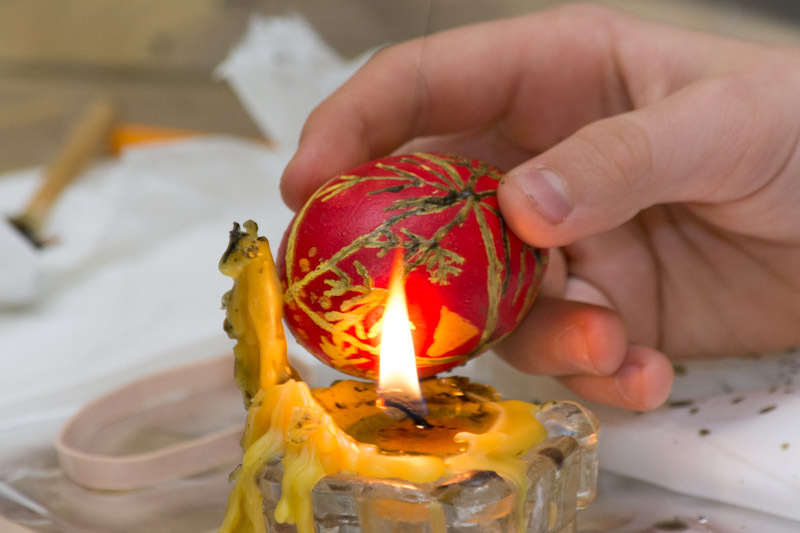 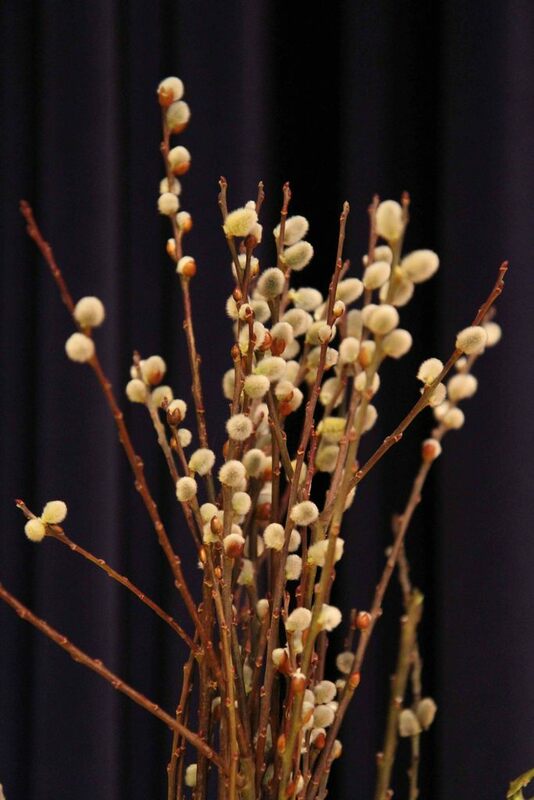 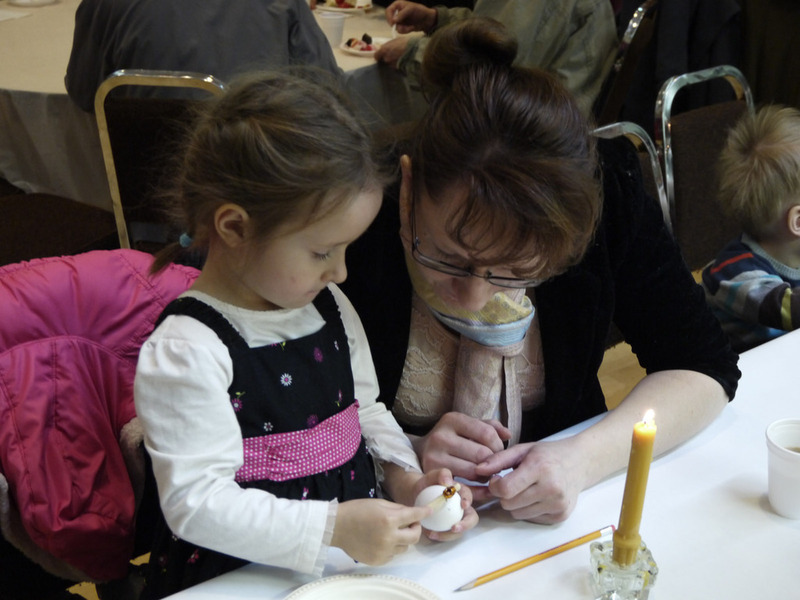 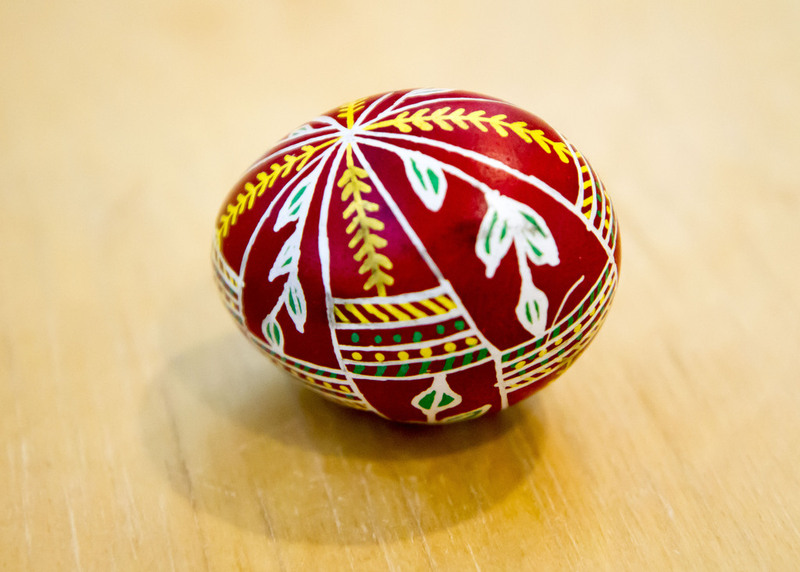 On Monday January 18th, Theophany Eve Vespers were held at St. Demetrius Ukrainian Orthodox Church, followed by the Parish Jordan Supper..
On Sunday March 29, the youth of St. Demetrius Ukrainian Orthodox Church (and some of their parents) participated in traditional Pysanka (Easter Egg) writing. 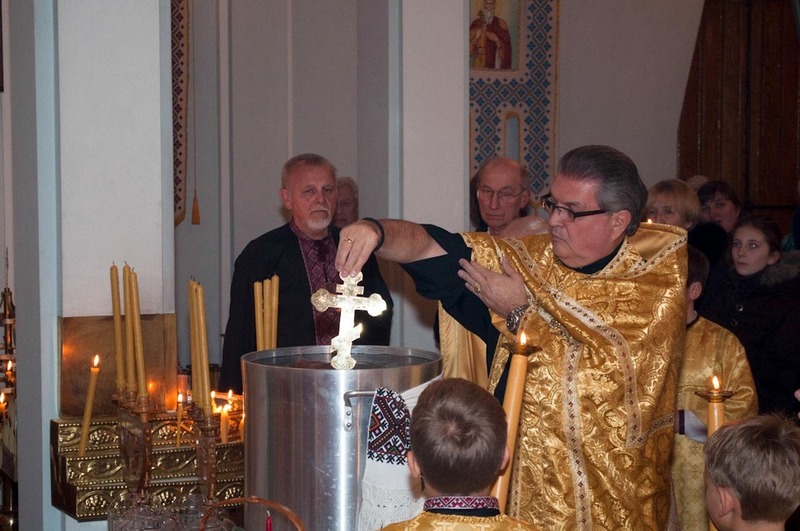 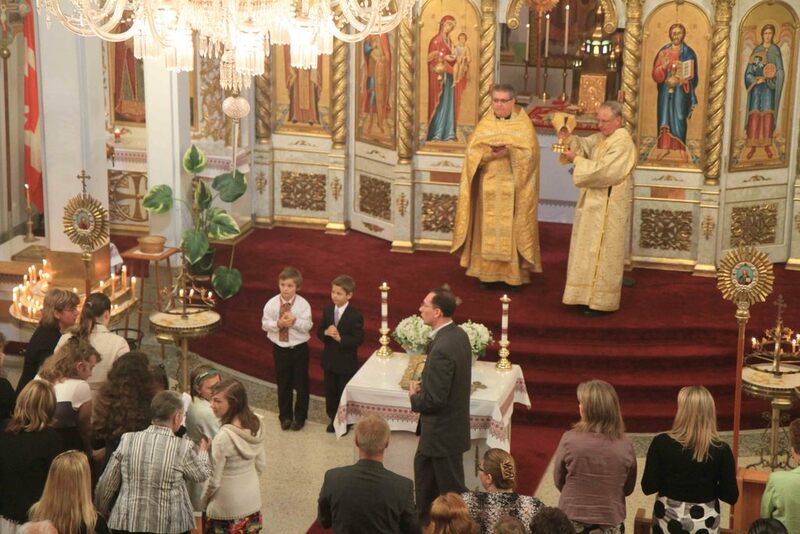 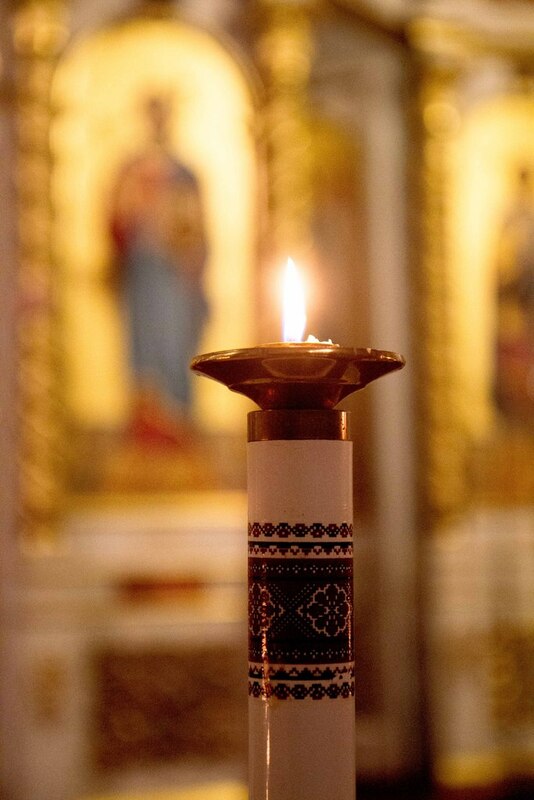 On Sunday December 21, St. Demetrius was visited by Sv. 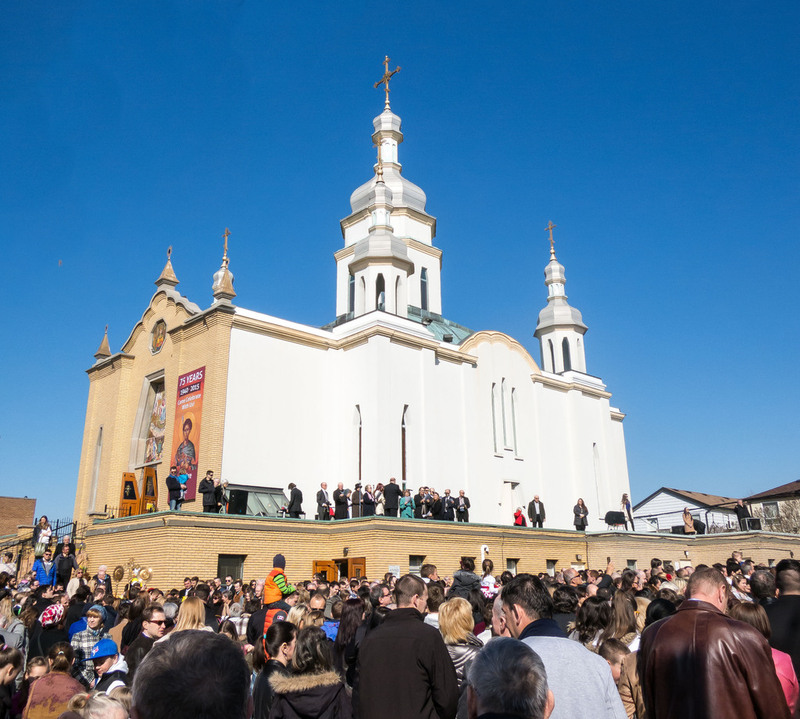 Mykolai (St. Nicholas). 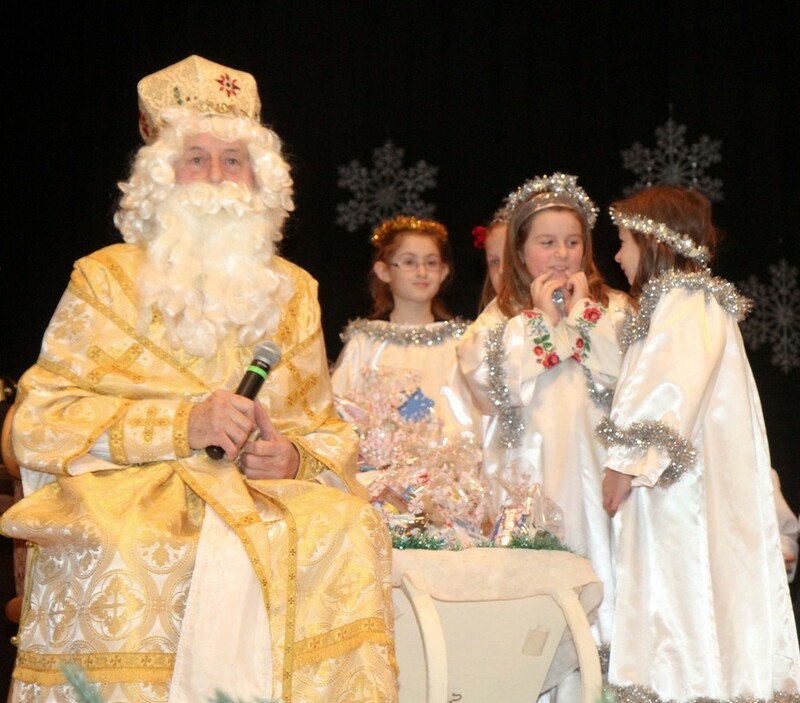 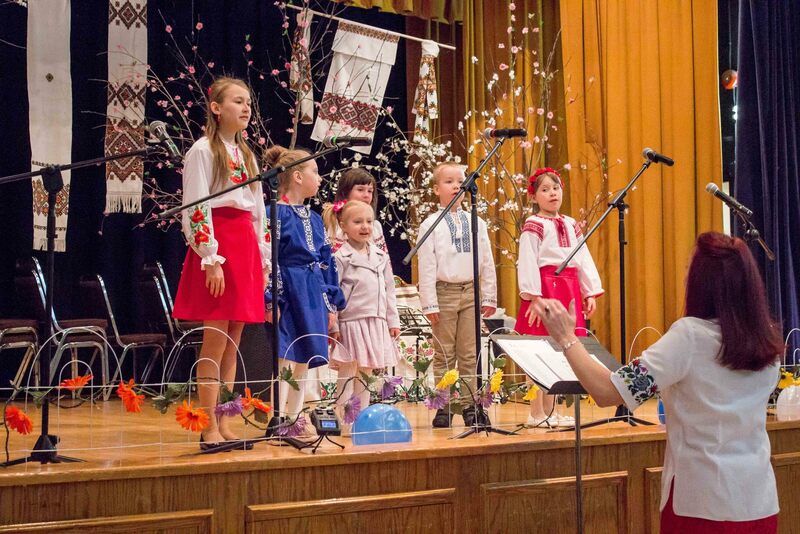 Children recited verses, sang songs, played on instruments during this annual concert to greet Sv. 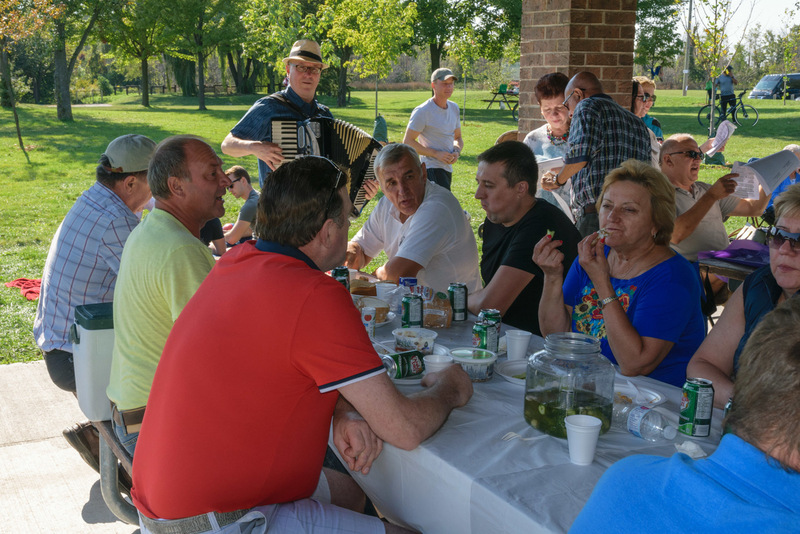 Mykolai. 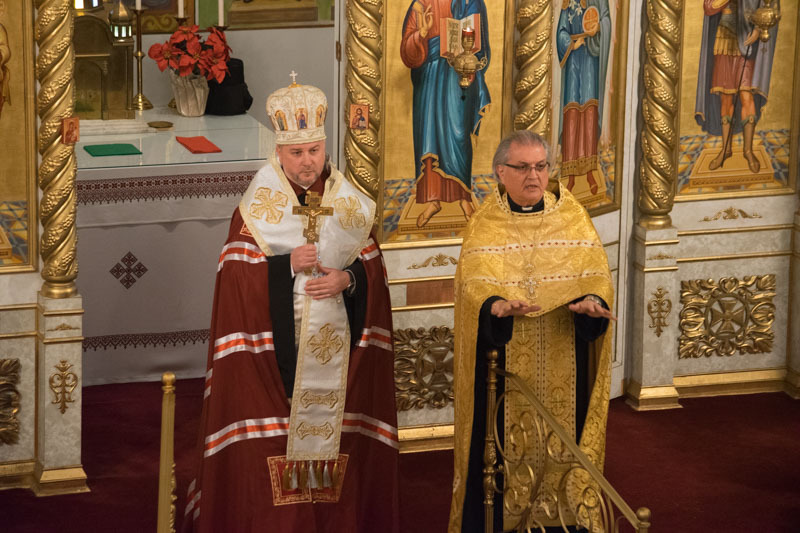 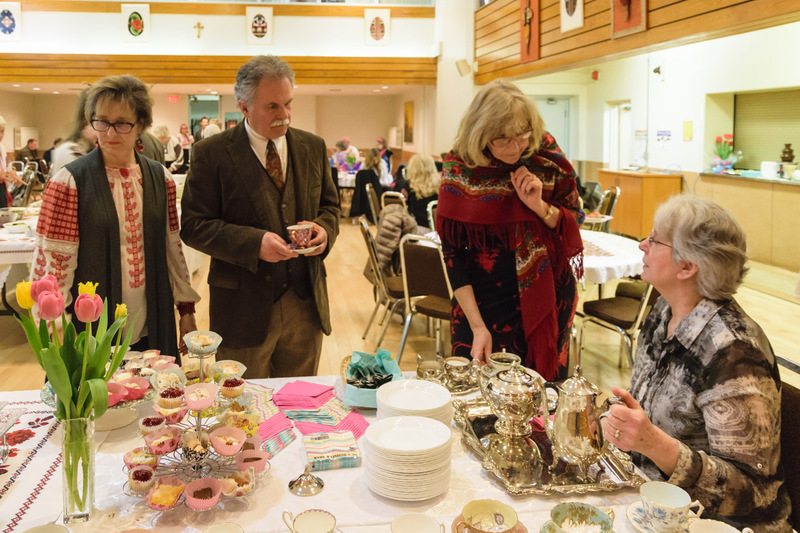 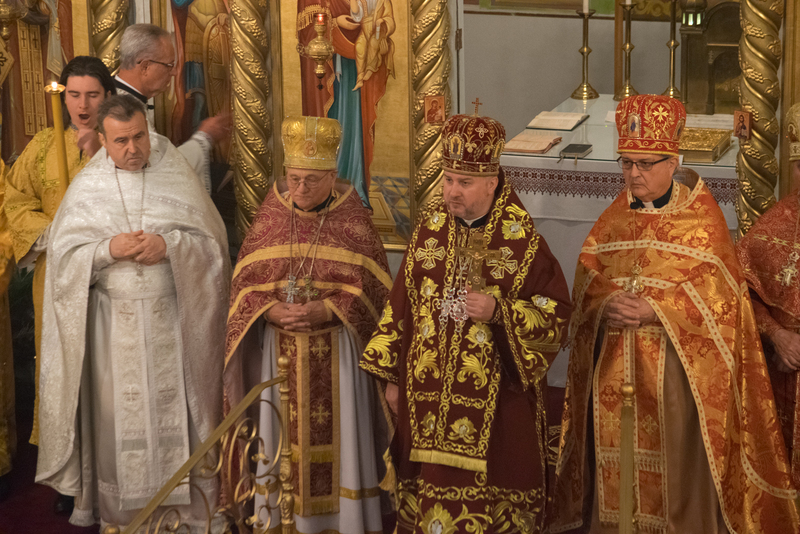 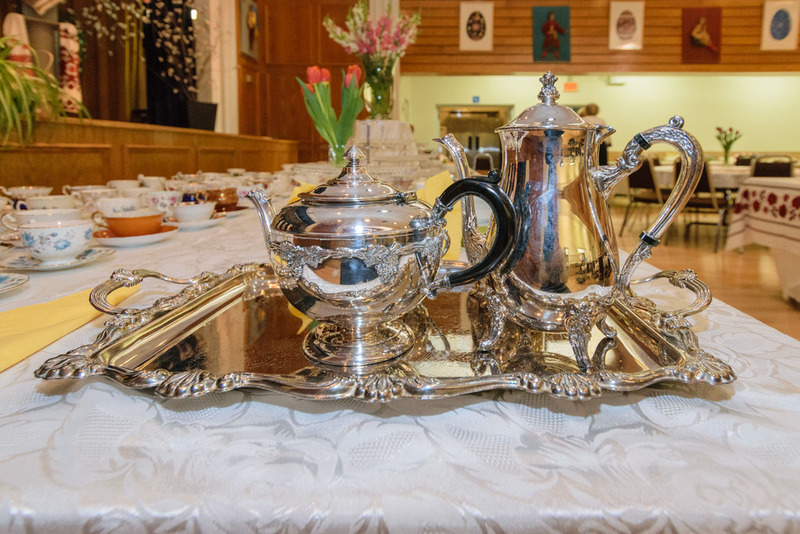 On Sunday November 9th, St. Demetrius celebrated its Parish Anniversary with an Archpastoral Divine Liturgy and celebratory banquet. 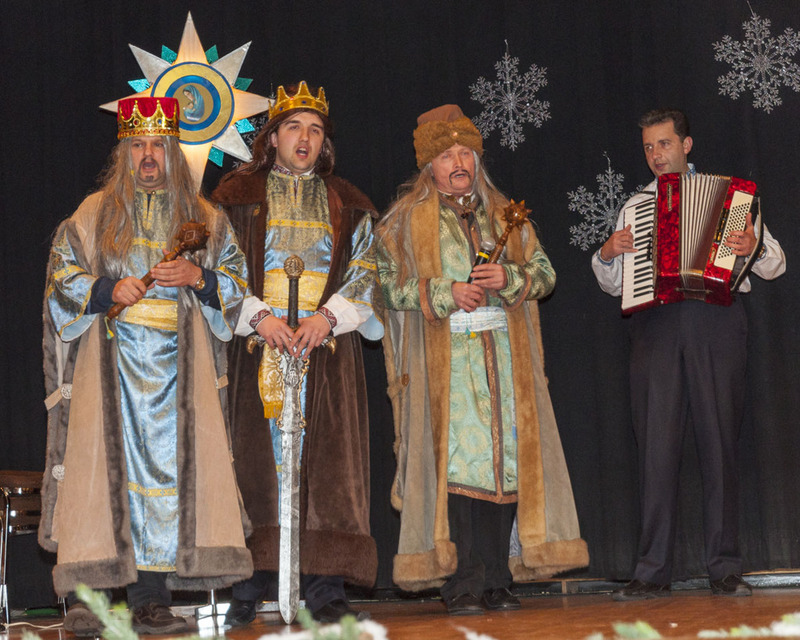 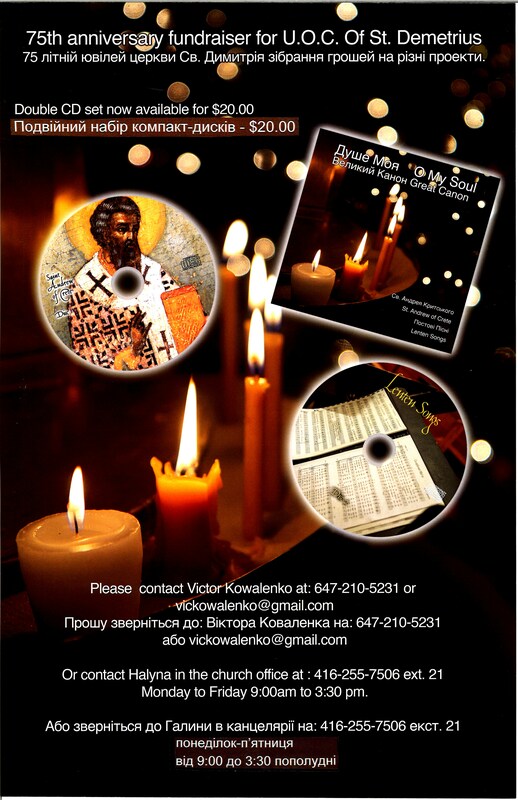 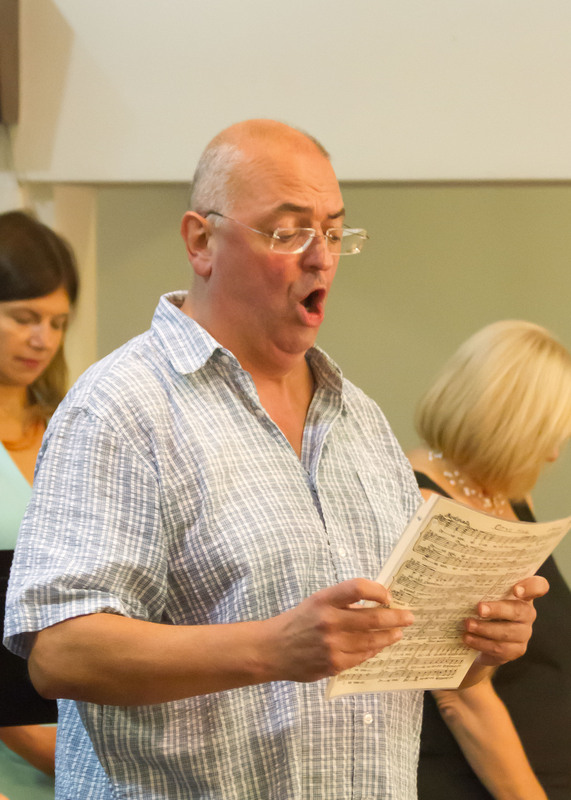 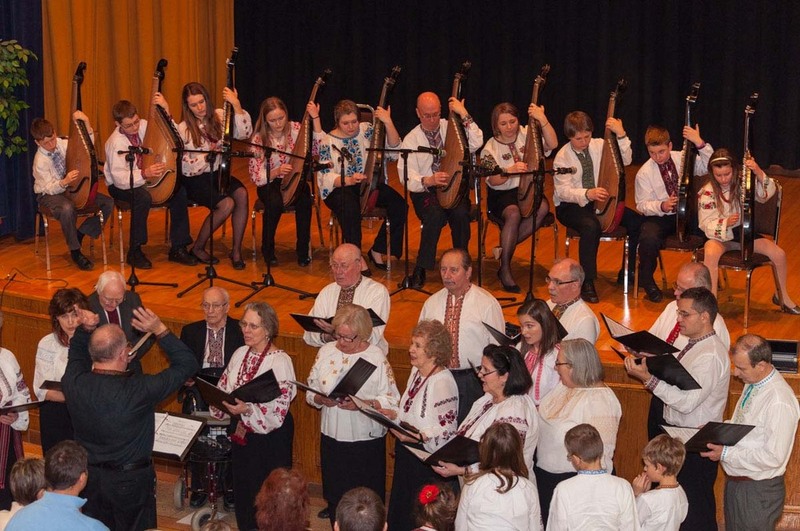 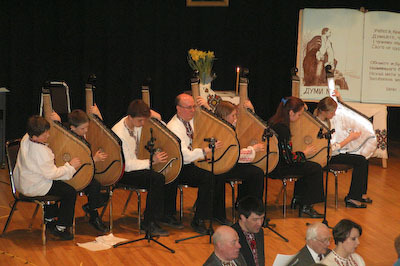 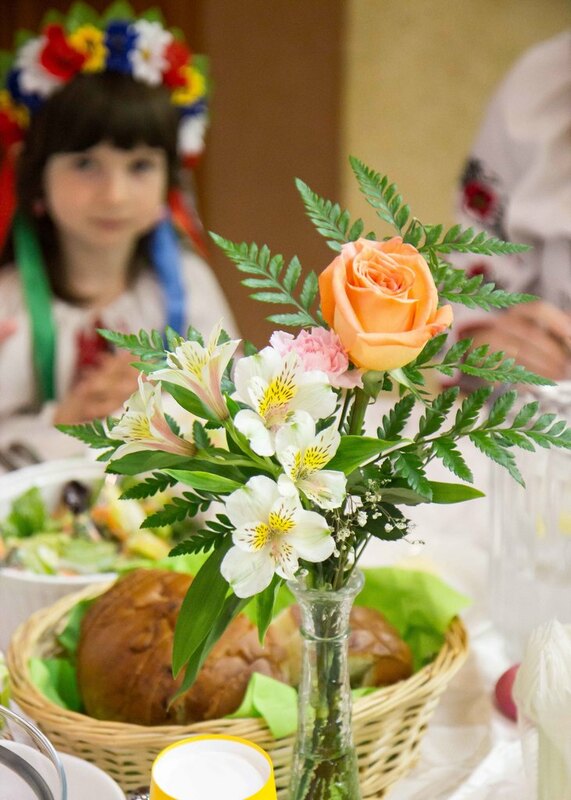 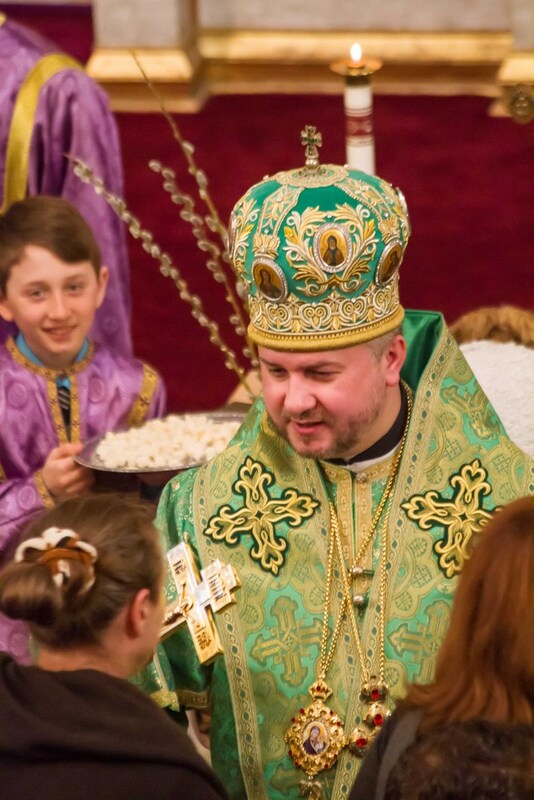 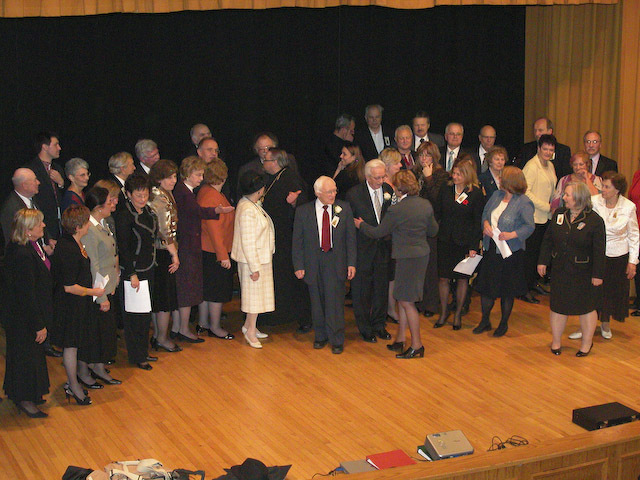 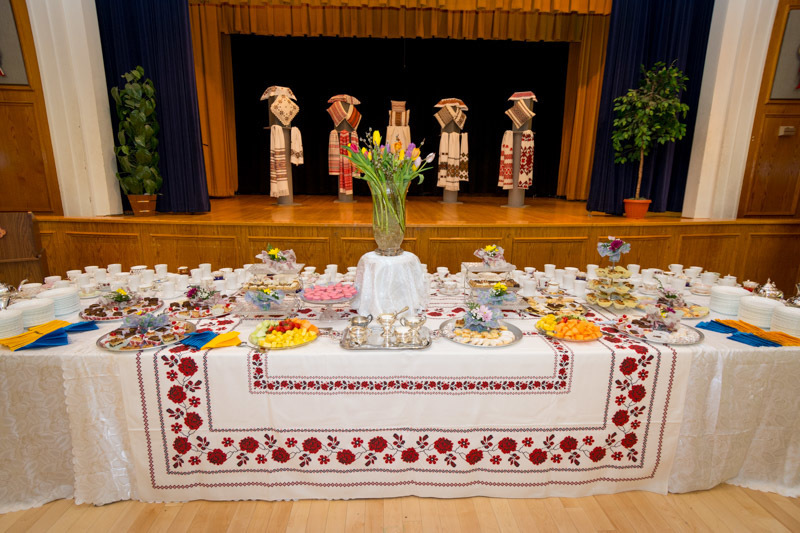 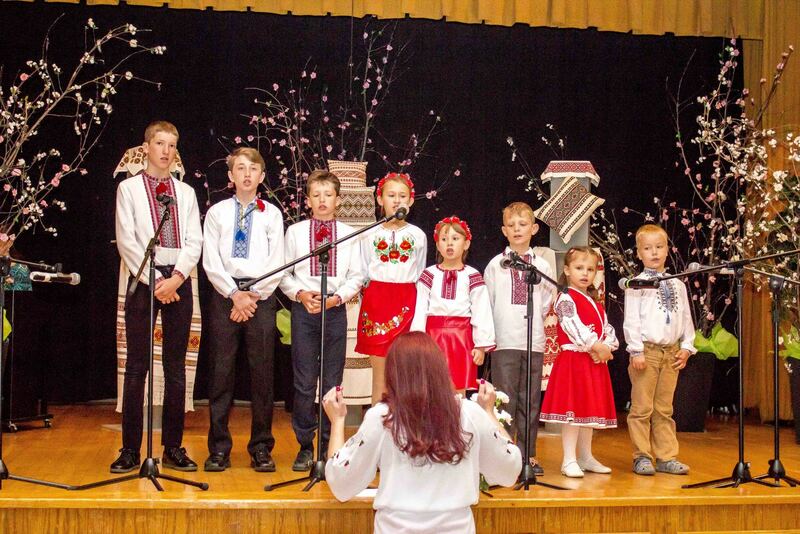 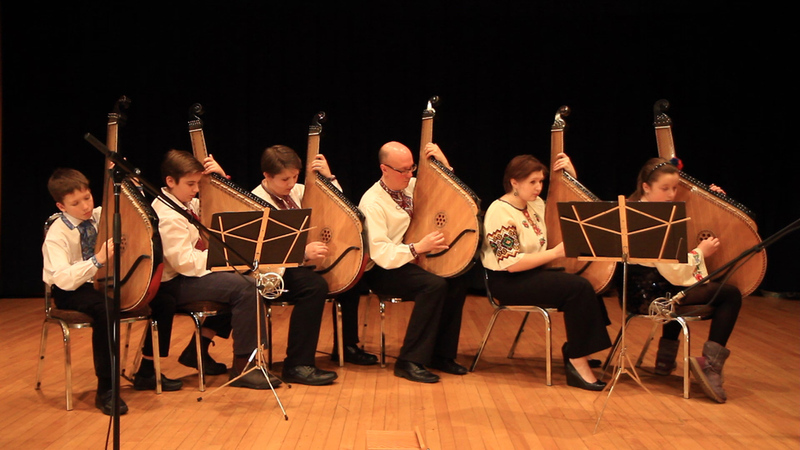 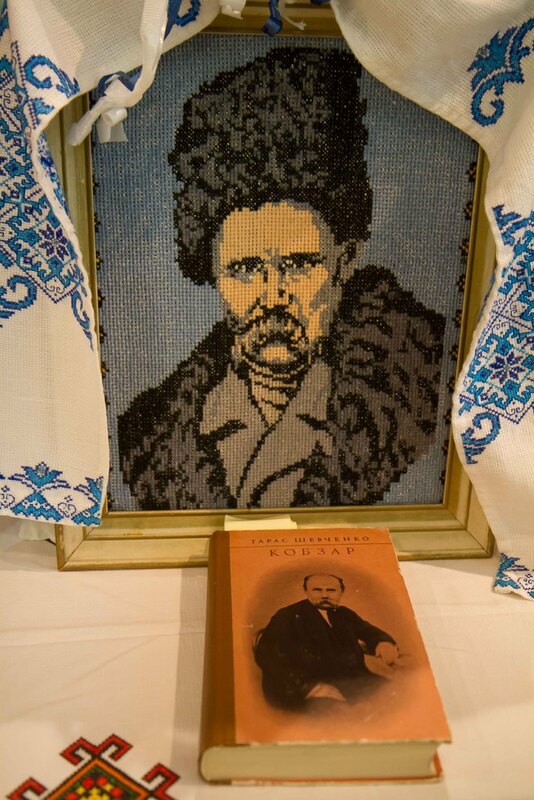 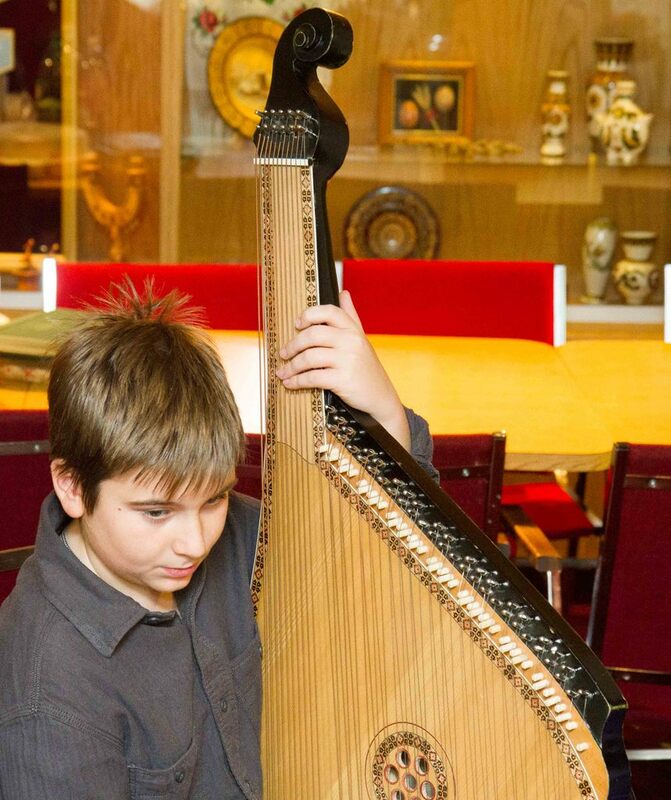 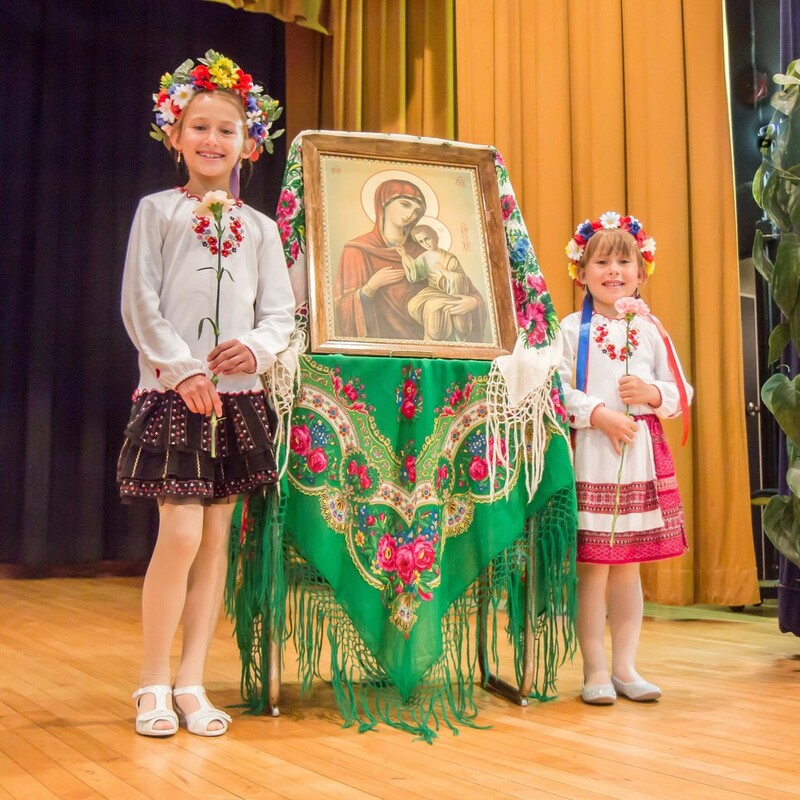 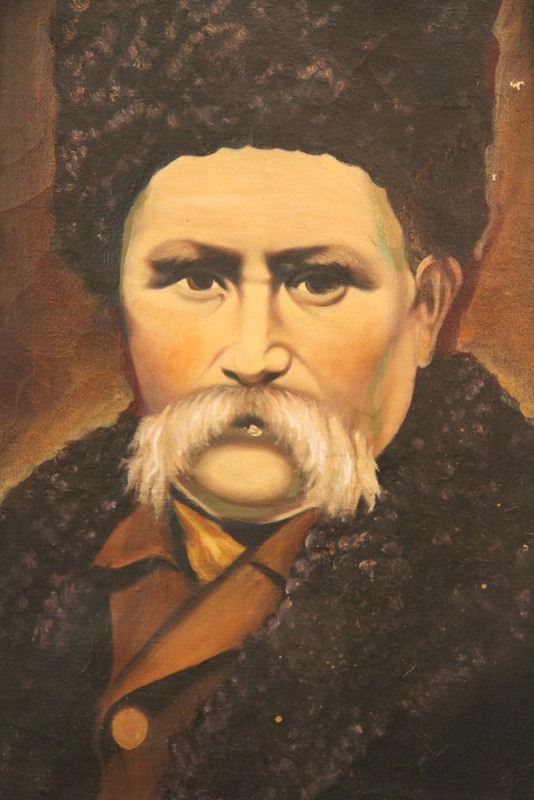 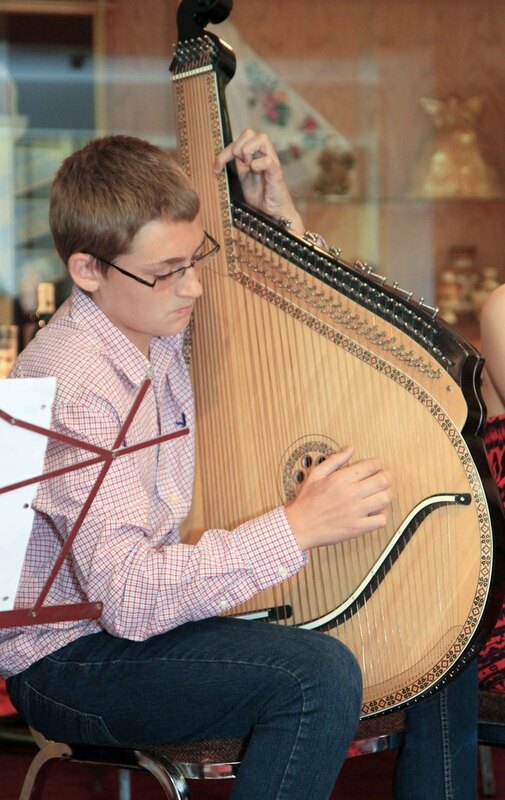 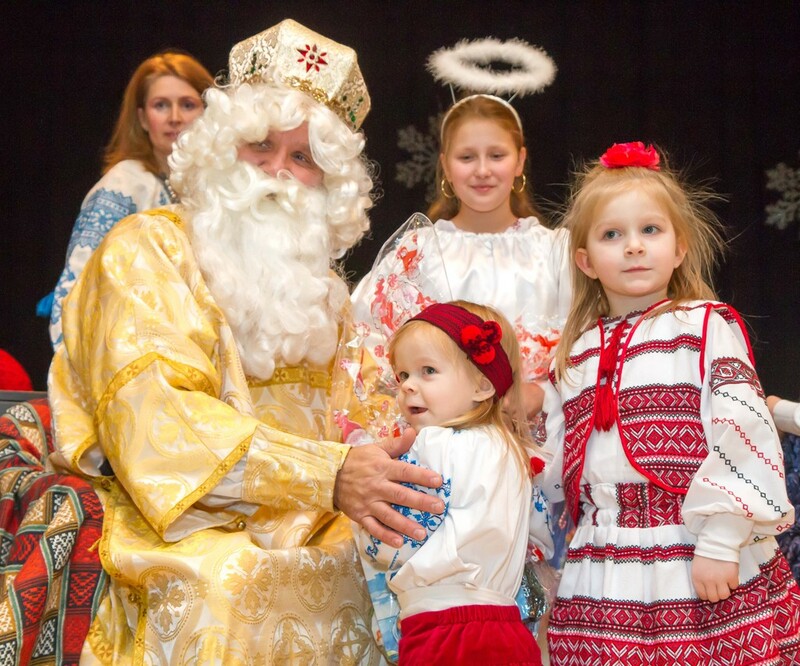 On Sunday March 2, St. Demetrius parish presented its annual Taras Shevchenko concert. 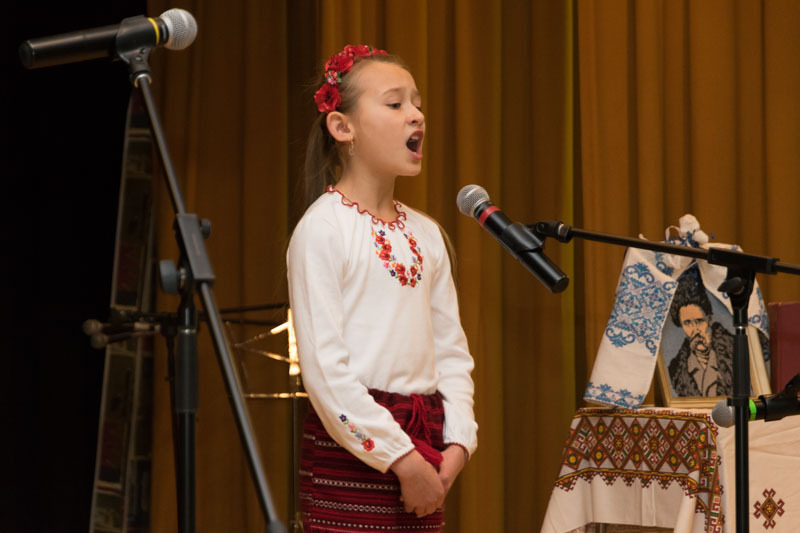 Requiem for "The Heaven's Hundred" - A Requiem (Panachyda) was held at St. Demetrius Ukrainian Orthodox Church on Friday February 28th for those who sacrificed their lives during the EuroMaidan in Ukraine. 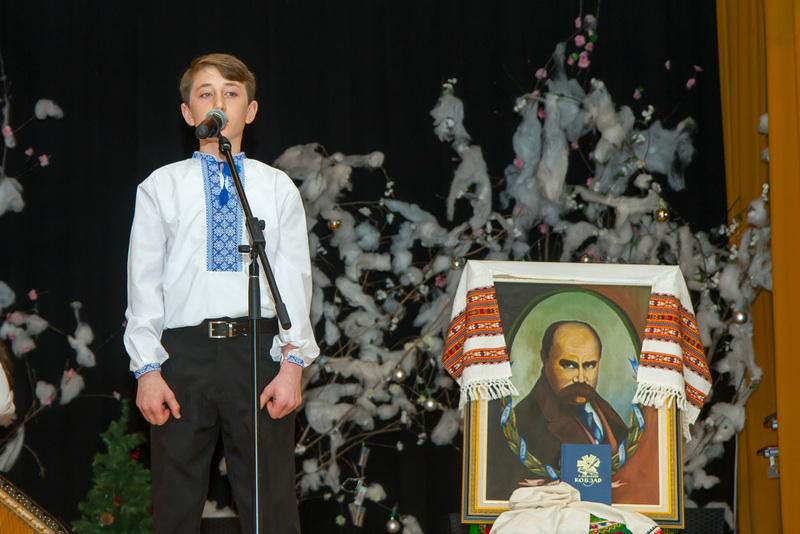 Панахида за «Небесну Сотню» - за тих, які загинули на Майдані. 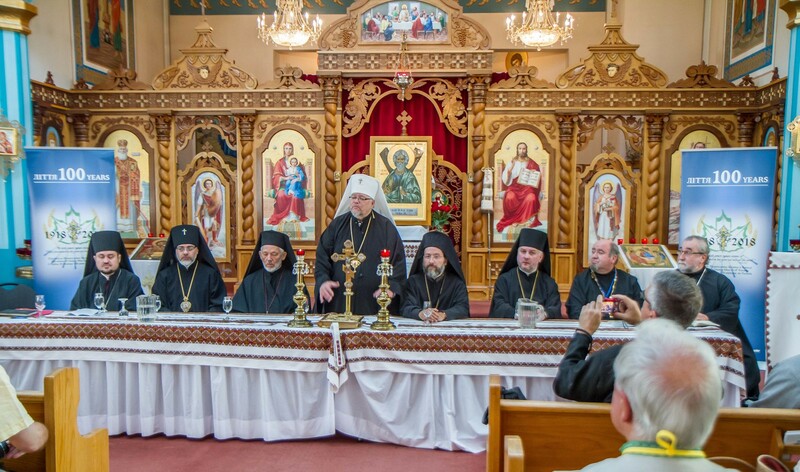 On March 23-24, St. Demetrius parish again hosted a workshop on Byzantine Icon Writing with Iconographer Alex Mezentsev. 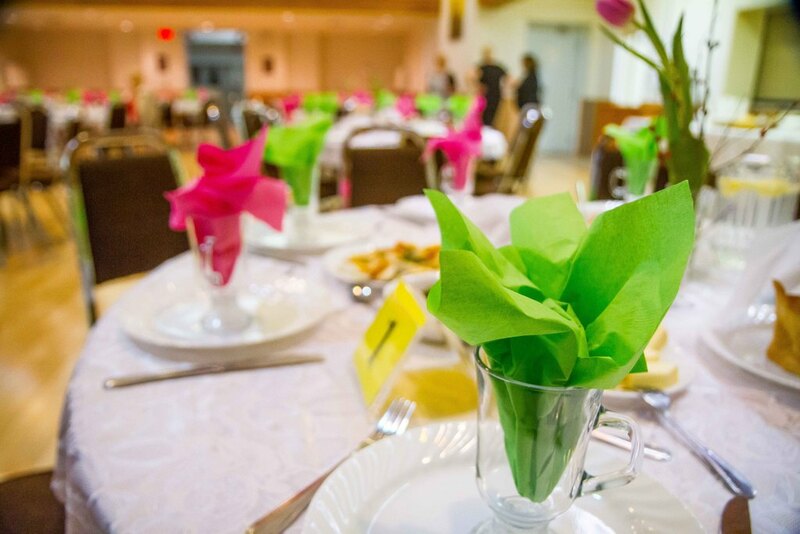 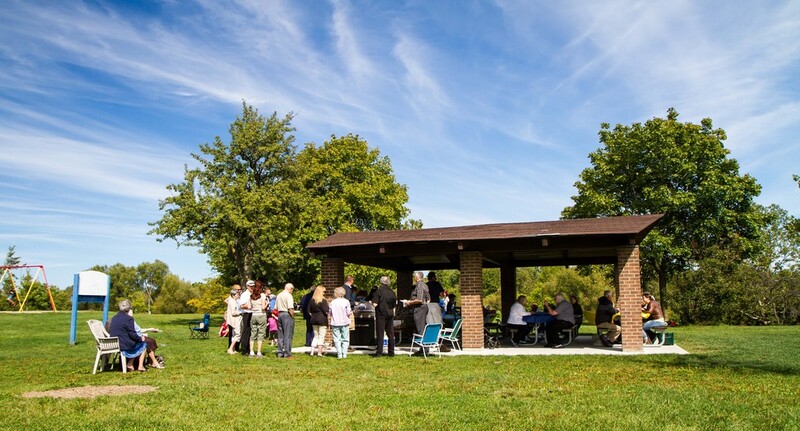 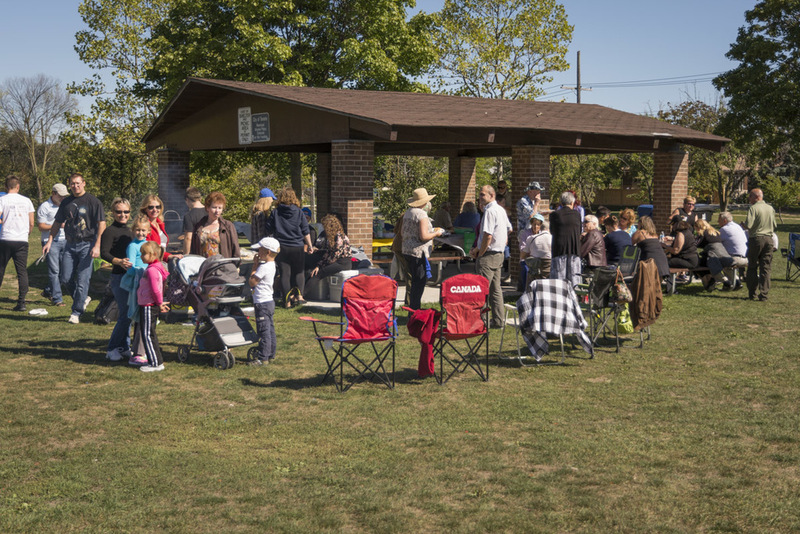 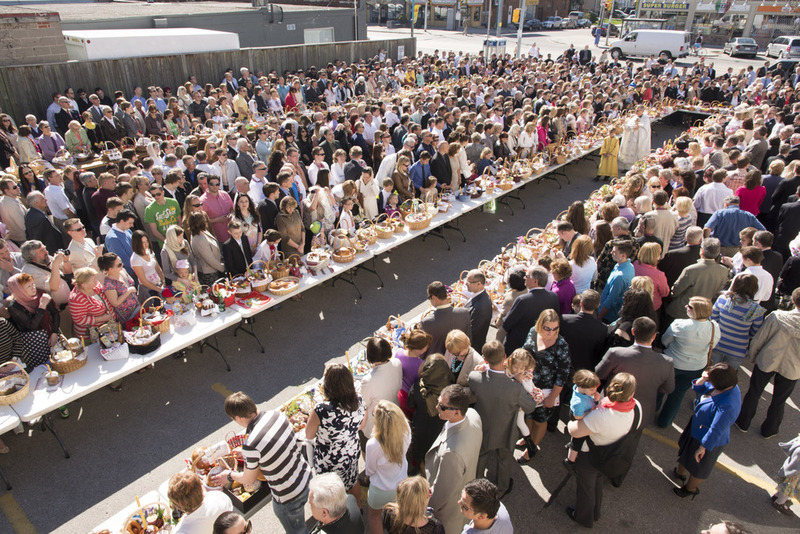 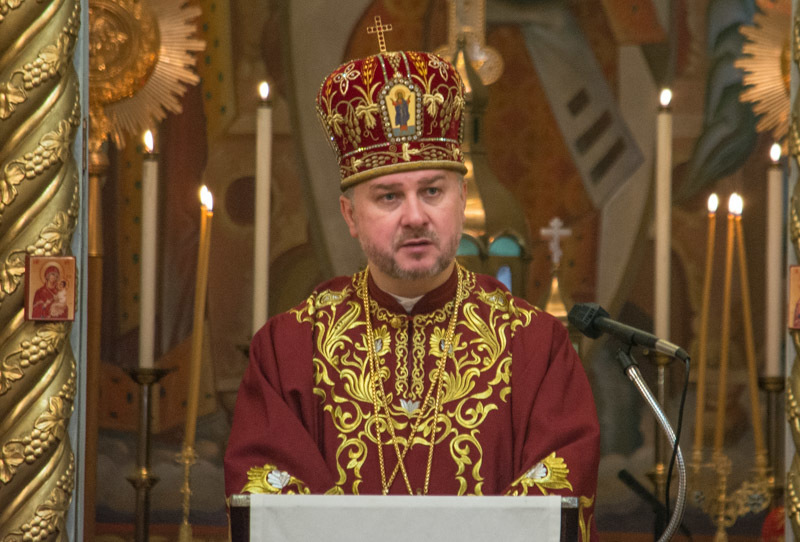 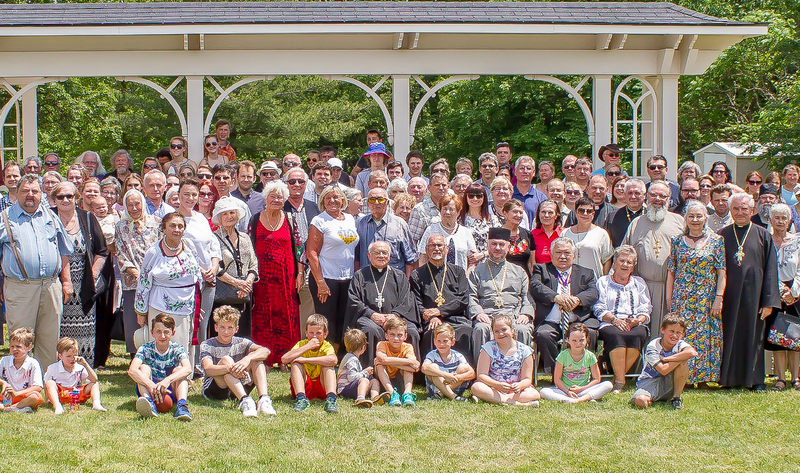 This year's annual Eastern Eparchial Gathering took place on Sunday, June 24th at the St. Volodymyr Cultural Centre in Oakville. 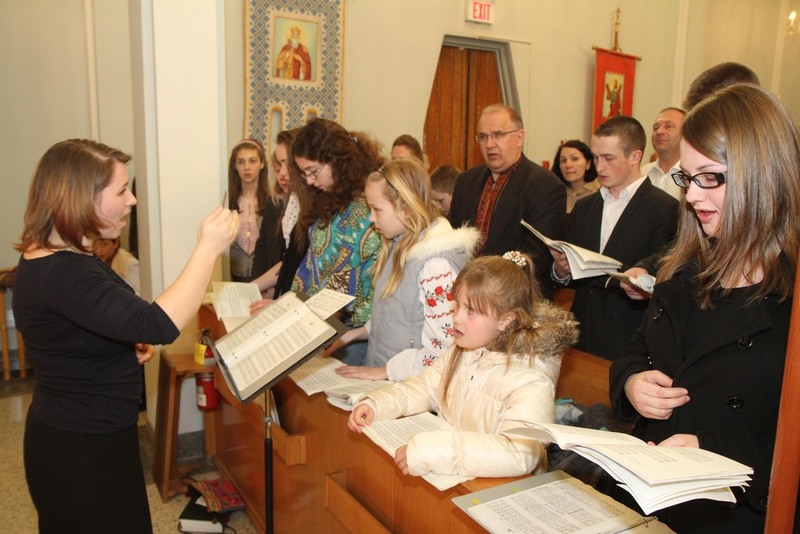 Congratulations to the six young members of our church who partook in the Holy Sacrament of Confession for the first time on Saturday May 26, 2012, followed by the Sacrament of Holy Communion on Sunday May 27th, 2012. 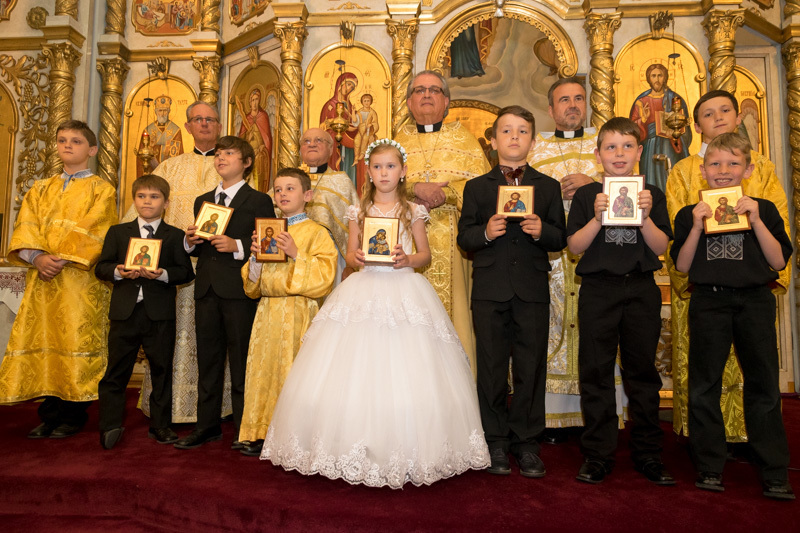 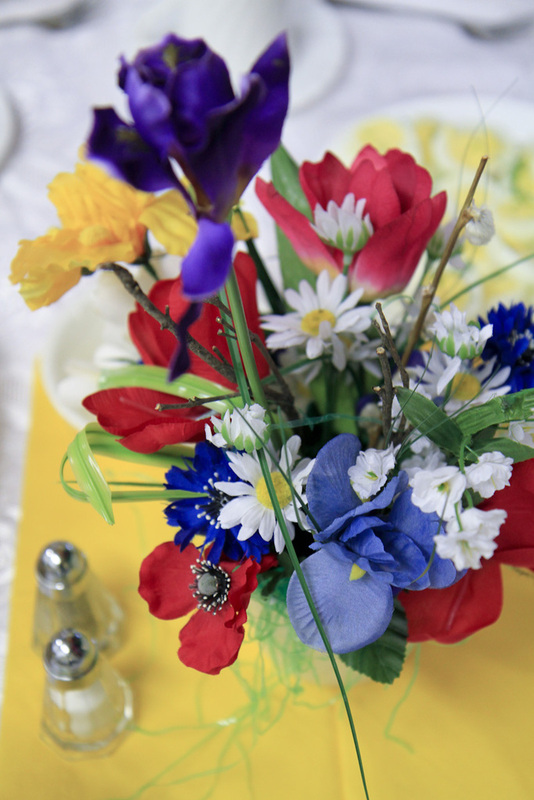 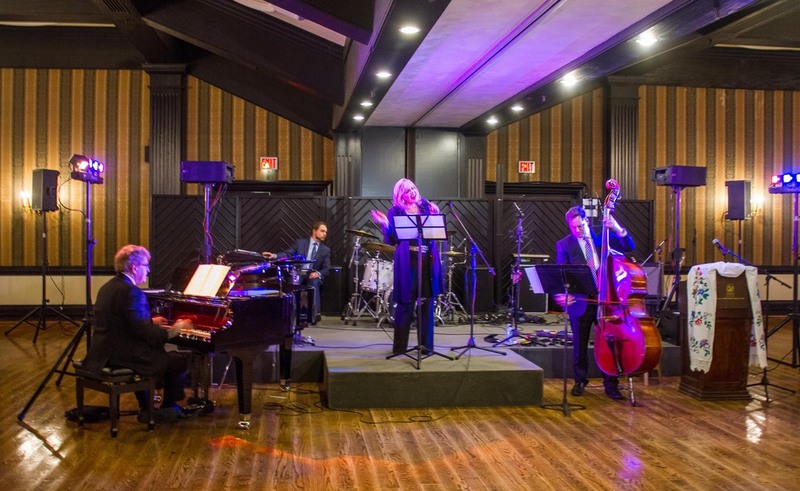 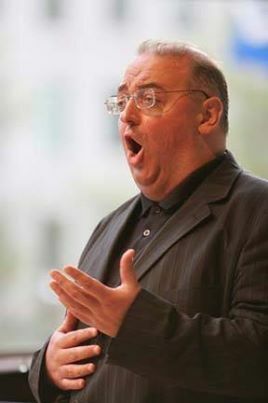 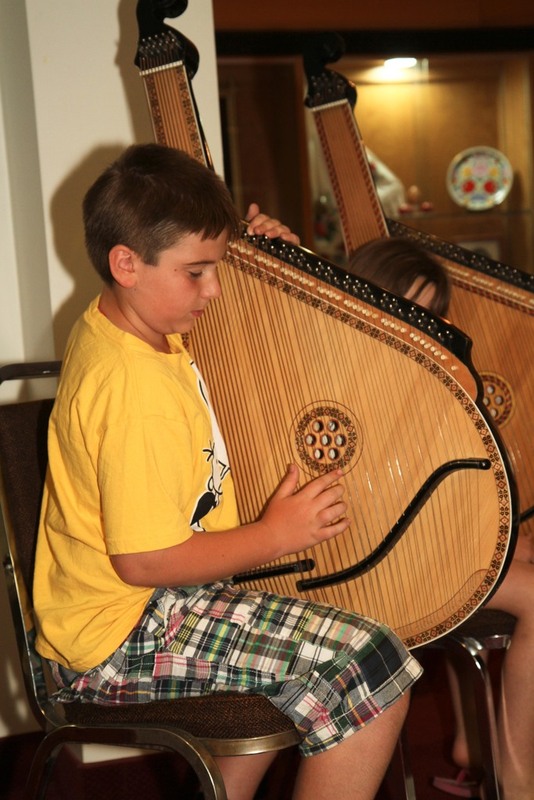 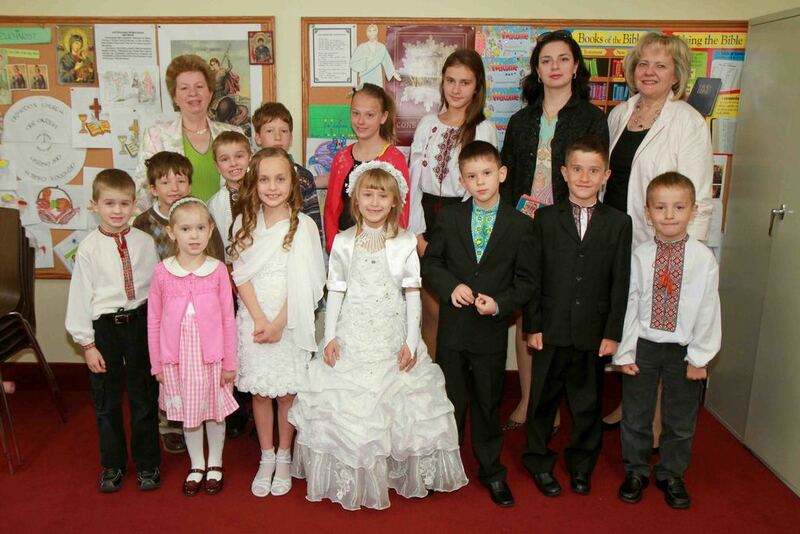 On Sunday May 13, St. Demetrius Parish held its annual Mothers' Day concert. 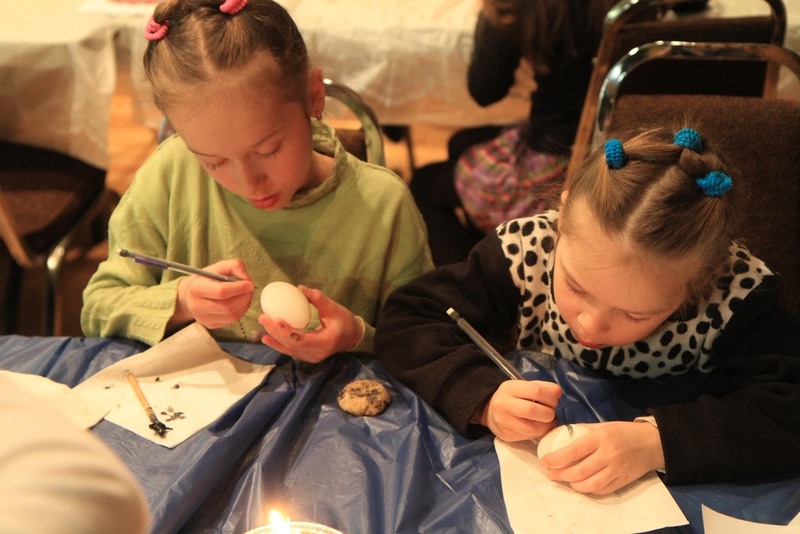 Youth of St. Demetrius participated in easter egg writing. 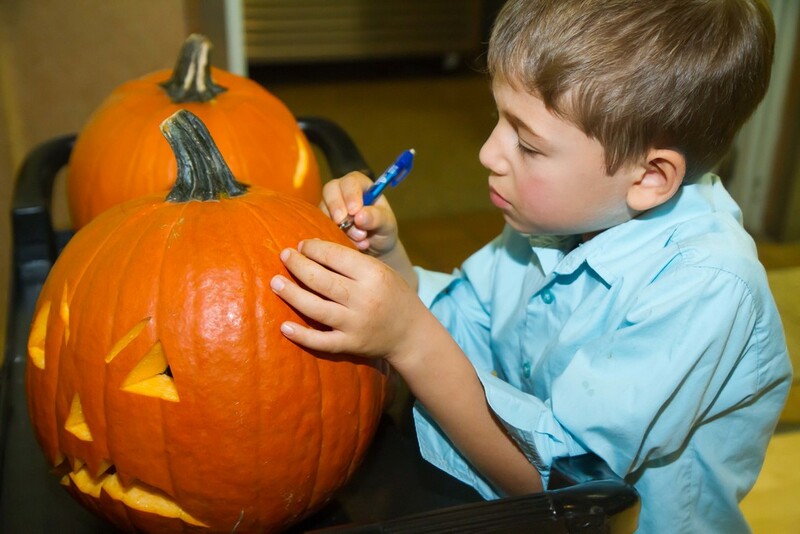 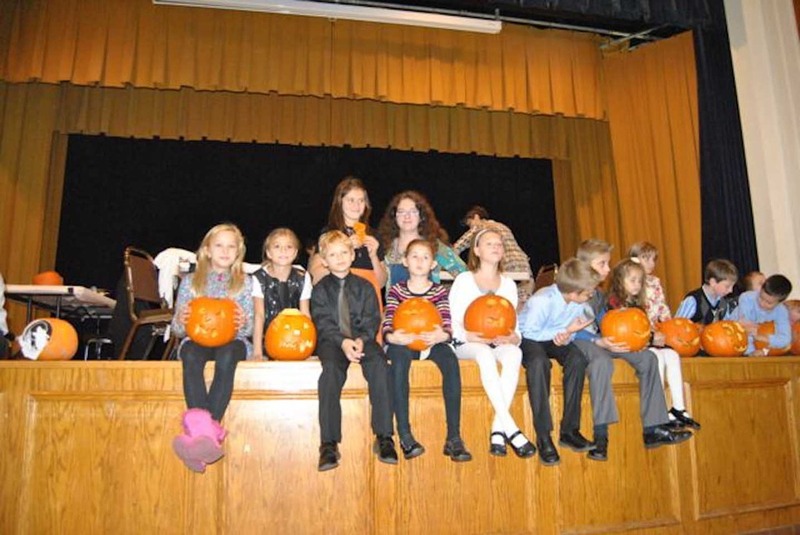 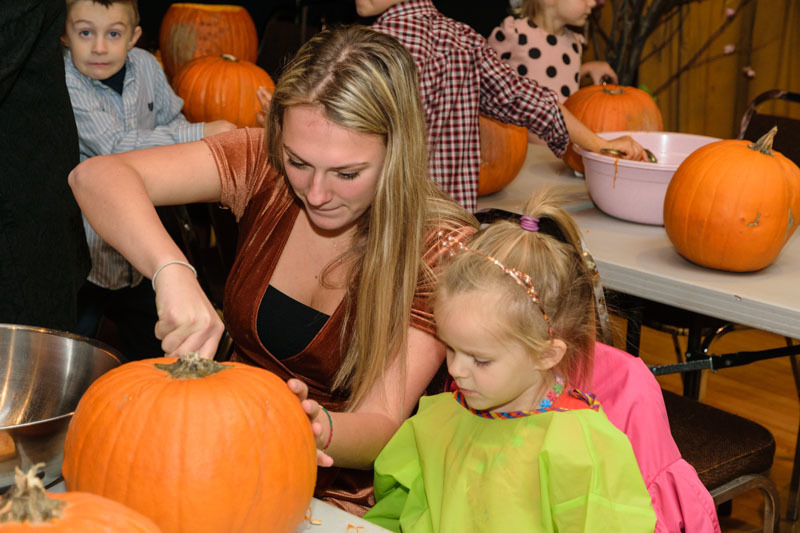 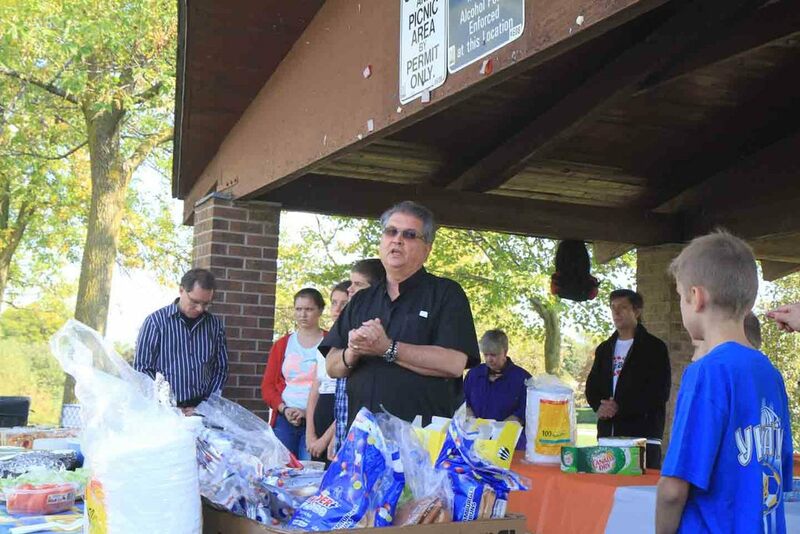 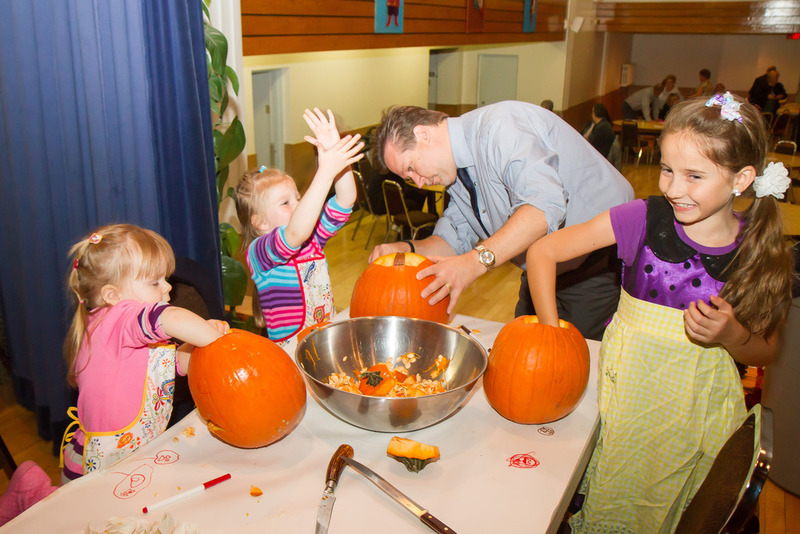 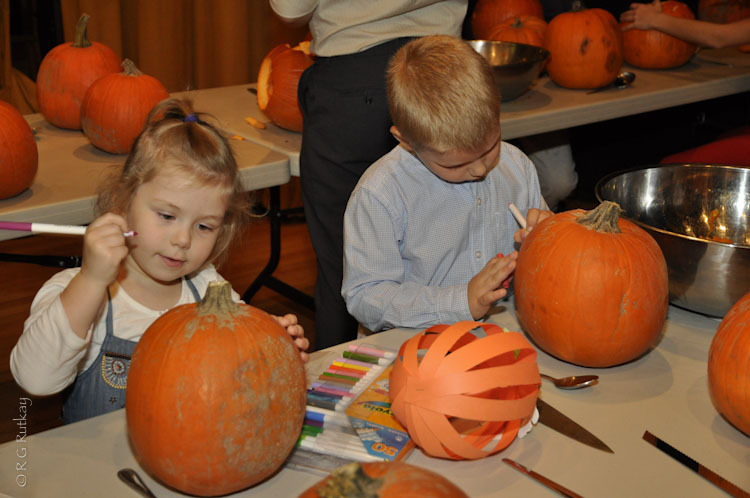 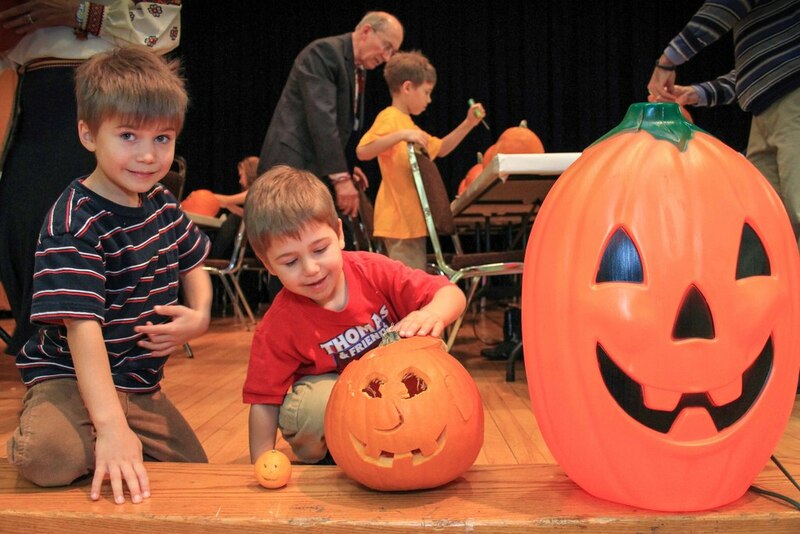 On Sunday October 30, Jr. CYMK hosted the first-ever pumpkin-carving activity for youth in the parish. 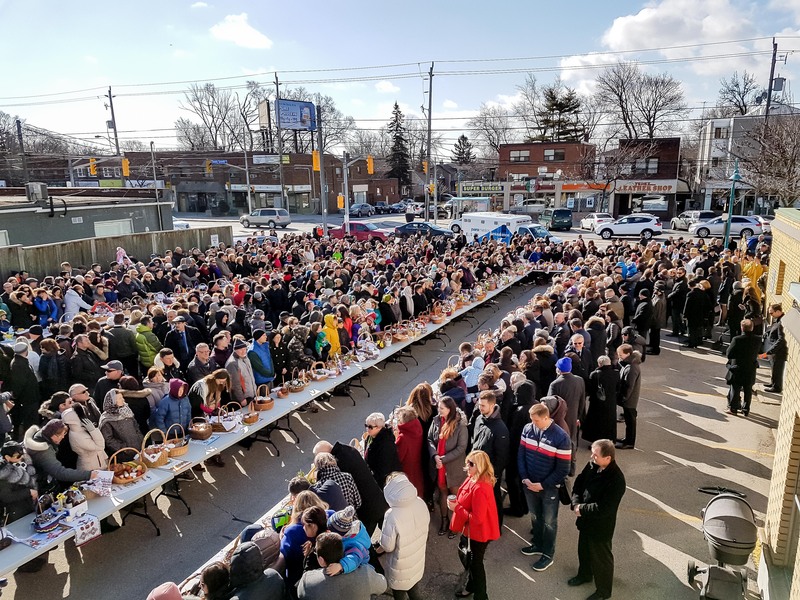 Easter Saturday basket blessing and Easter Sunday service and basket blessing. 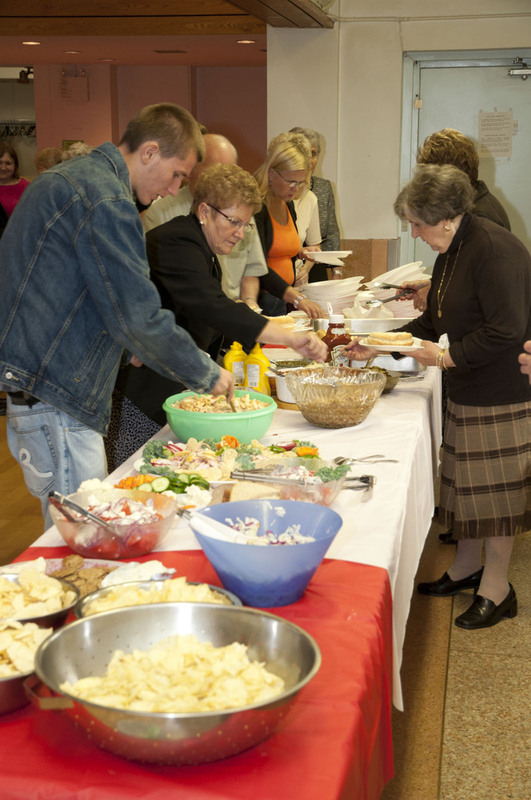 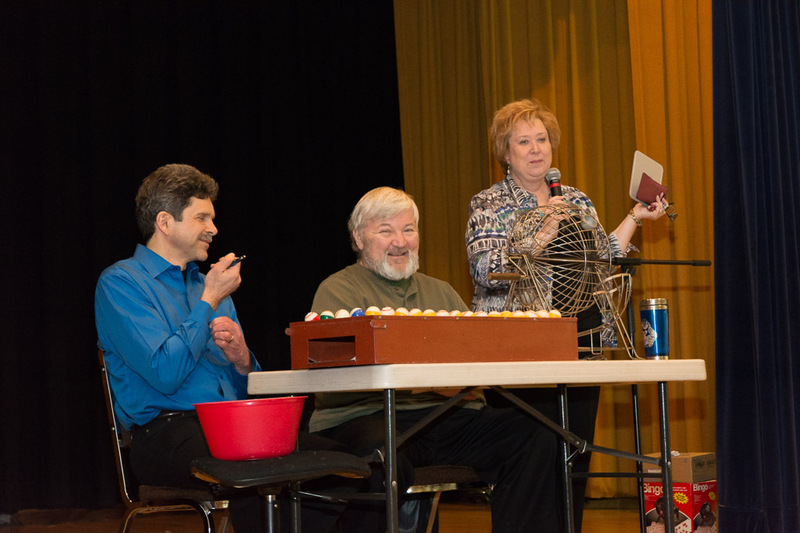 On Monday April 18, the parish along with Senior CYMK hosted a viewing of the movie “The Passion of the Christ”. 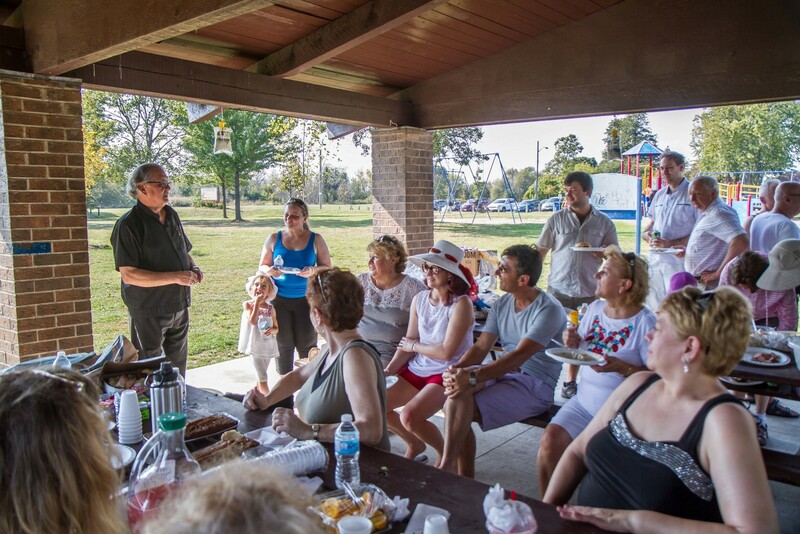 Following the movie, Father Walter led the group in a brief discussion as they shared questions and thoughts as a result of the movie. 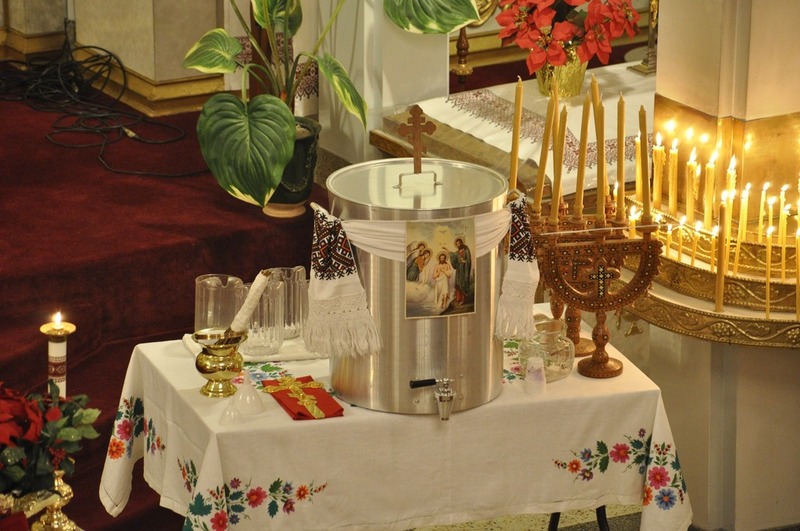 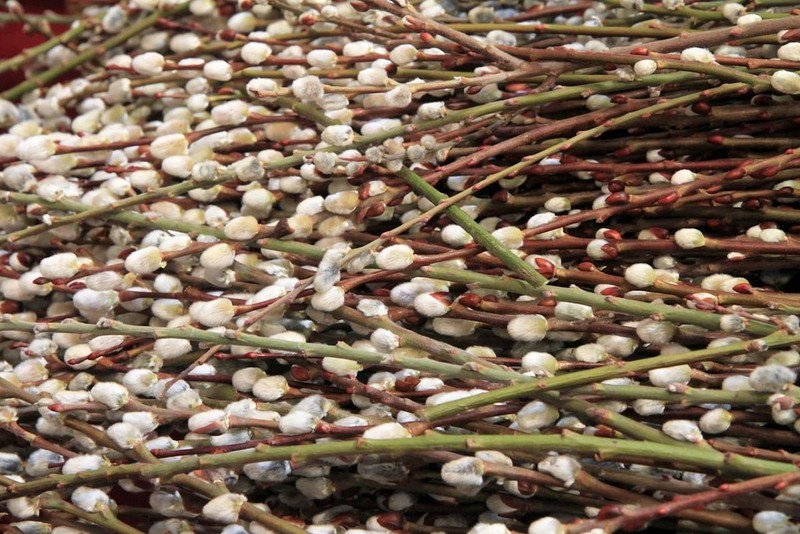 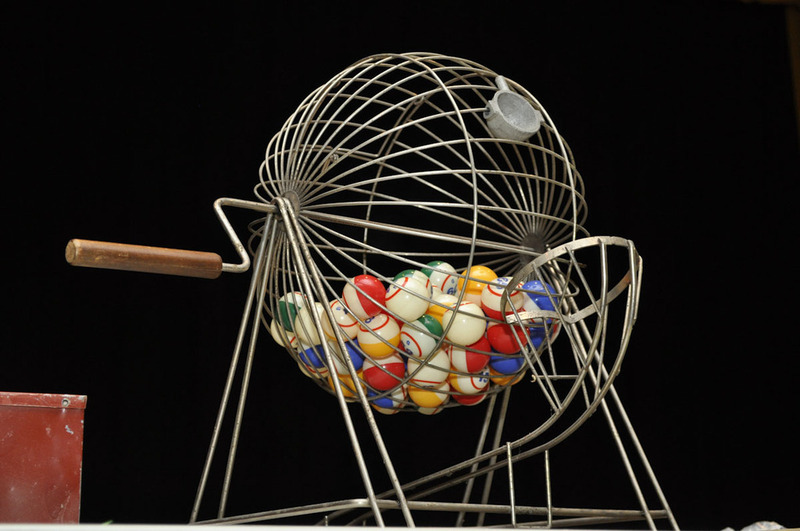 As quoted by a participant, “it gave us something to think about during this Holy Week”. 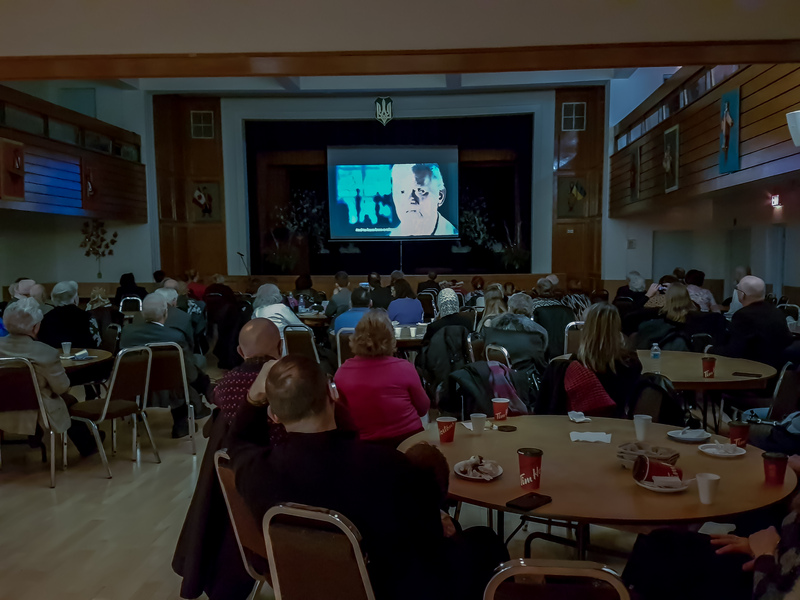 Thank-you to all who helped with and participated in the viewing of the movie. 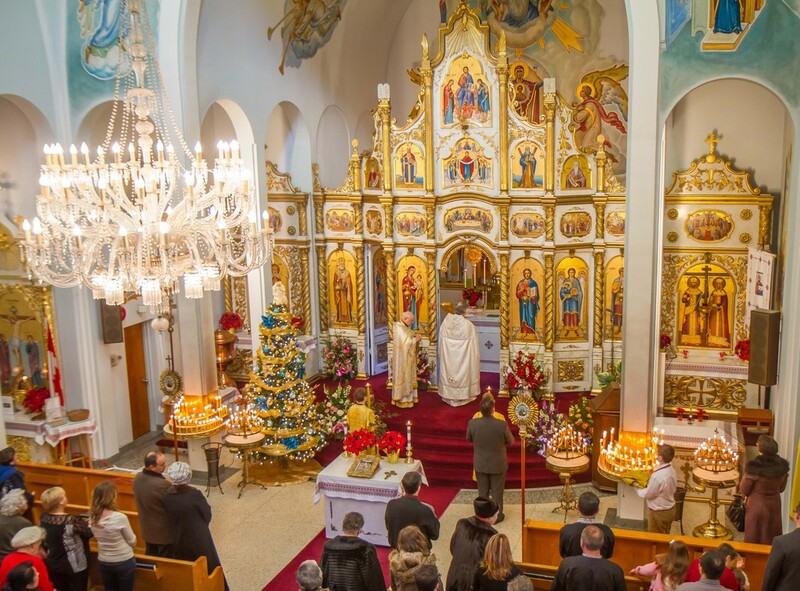 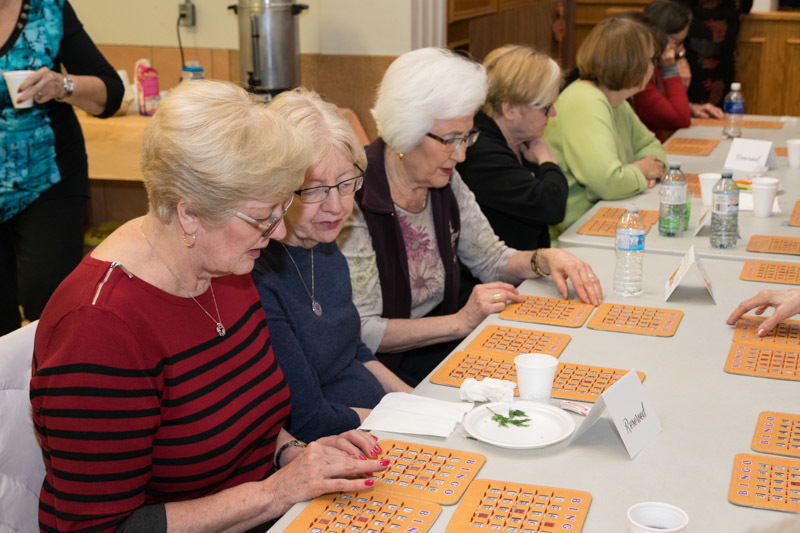 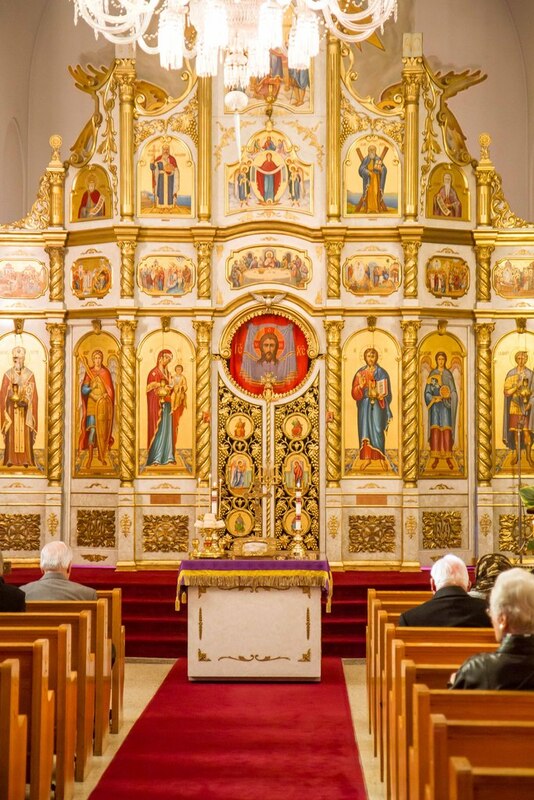 On Saturday and Sunday March 12th and 13th, the parish hosted a two-day Iconography workshop in the hall of St. Demetrius Ukrainian Orthodox Cathedral. 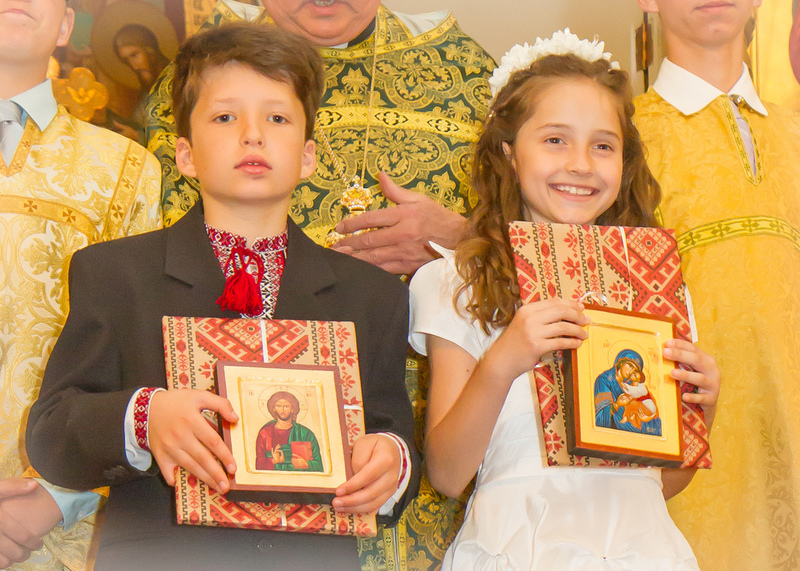 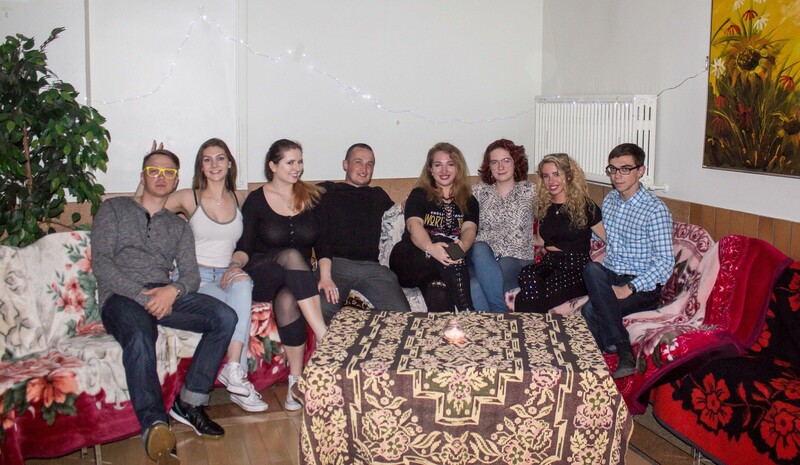 The presentation and practical workshop was provided by Alex Mezentsev, Iconographer. 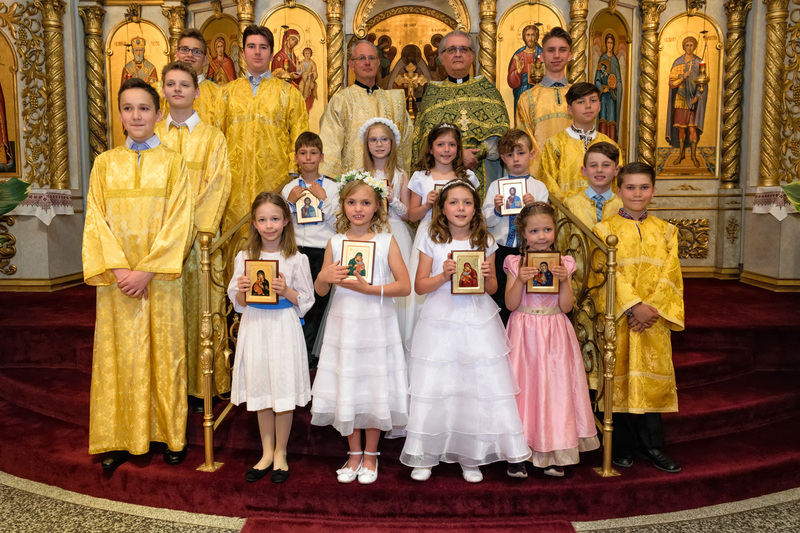 There were at least 28 participants of all ages in the workshop, who first enjoyed a slideshow presentation on the history of Iconography, and then participated hands-on by writing their own icons. 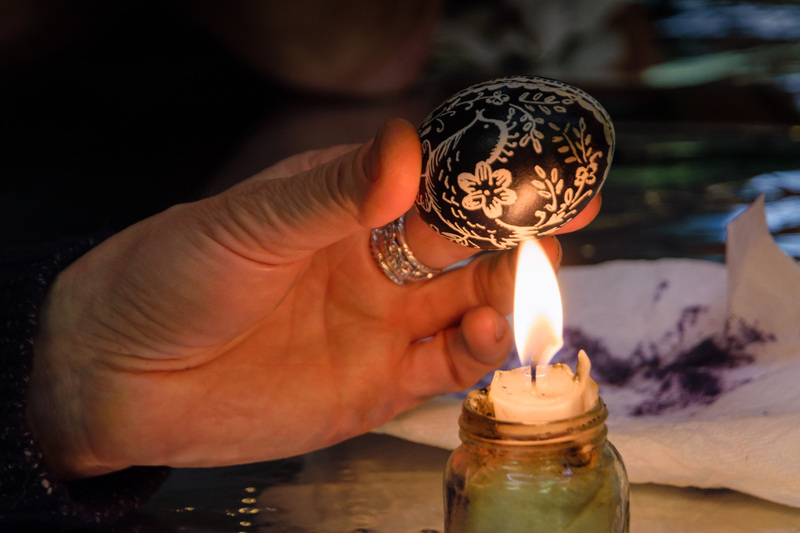 Participants used traditional techniques of charcoal image transfer, gold leafing, and painting using specially-prepared tempura paints. 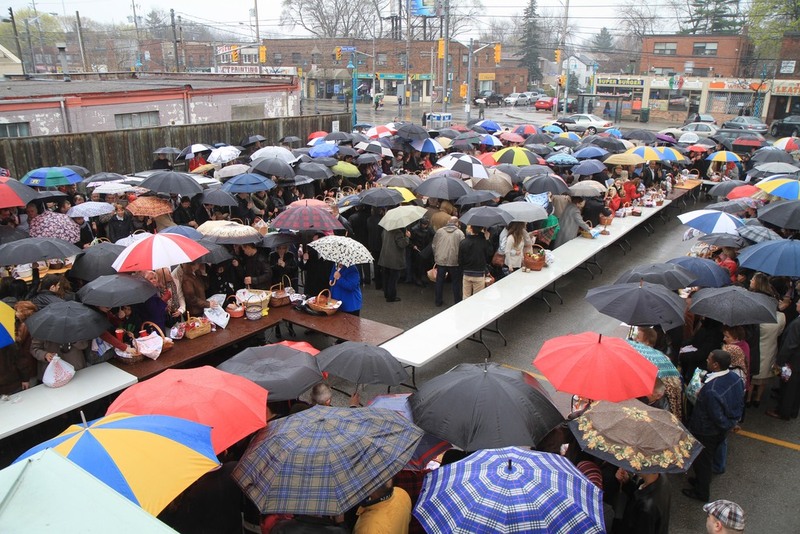 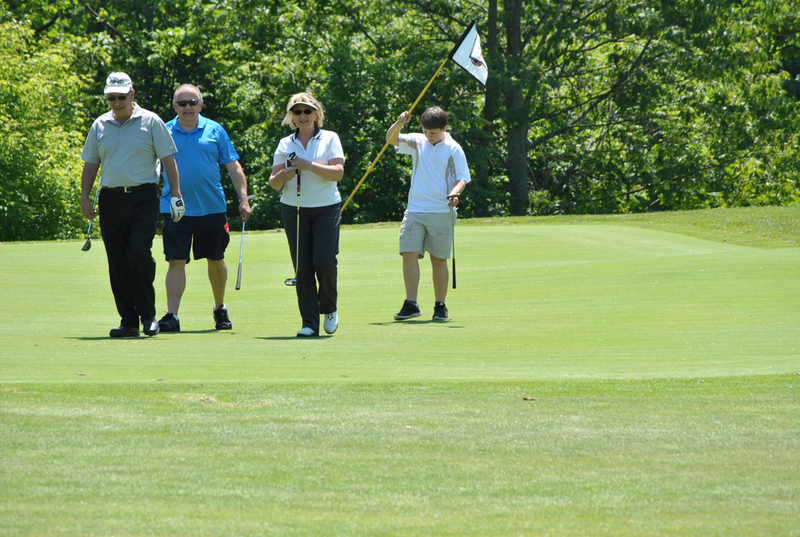 Thank-you to all who participated. 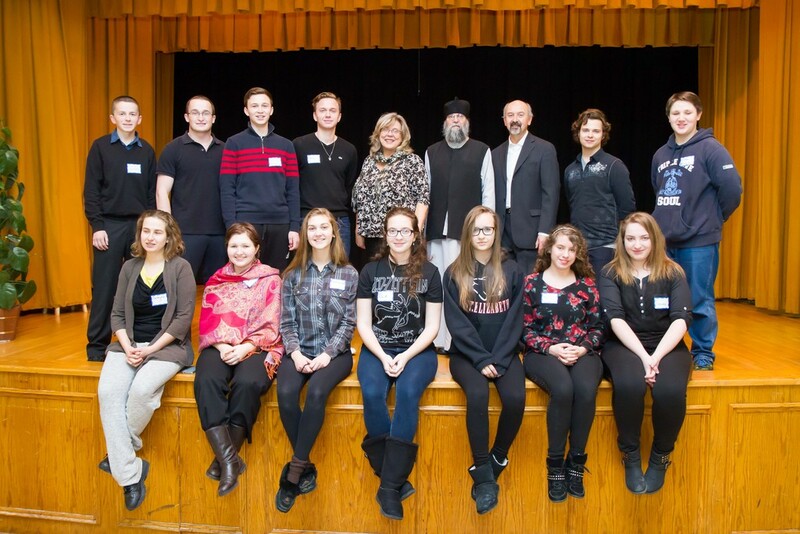 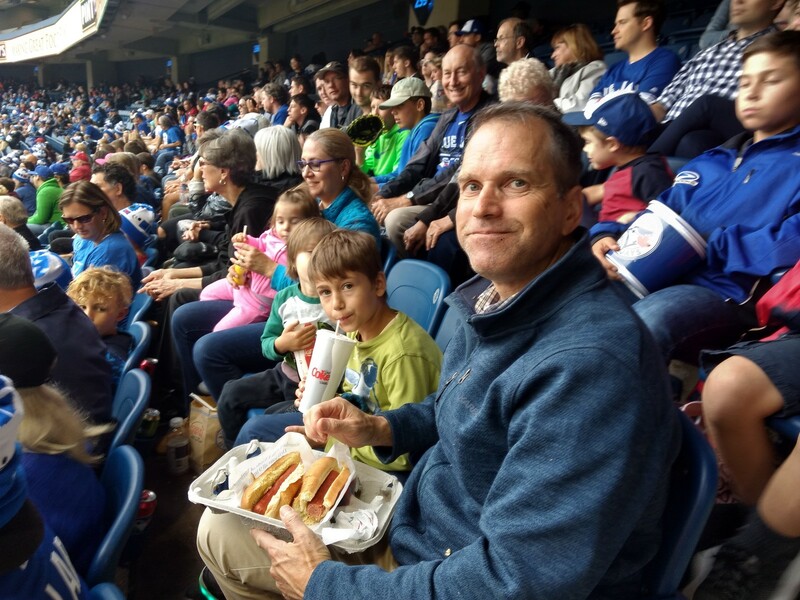 Thank-you to the presenter Alex Mezentsev for providing the interesting and informative sessions, and thank-you to Michael Zienchuk for organizing the event. 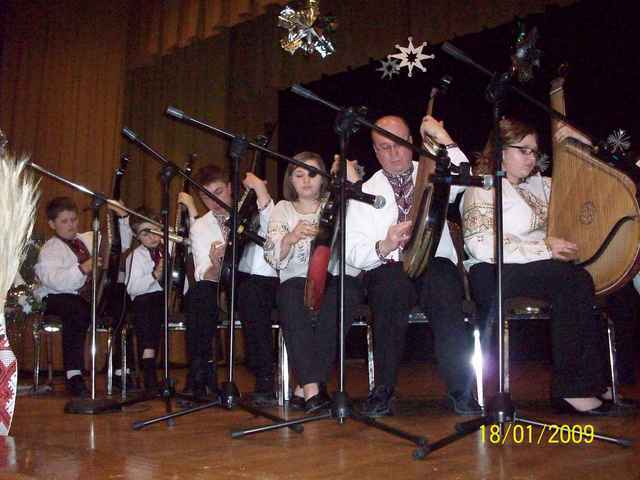 After the Jordon Supper the St Demetrius Bandura Group perform several Koliady to end off the evening celebrations. 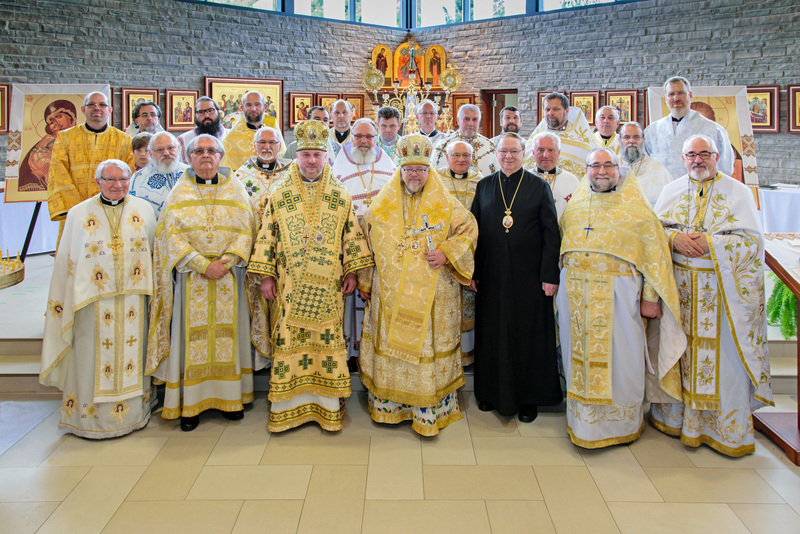 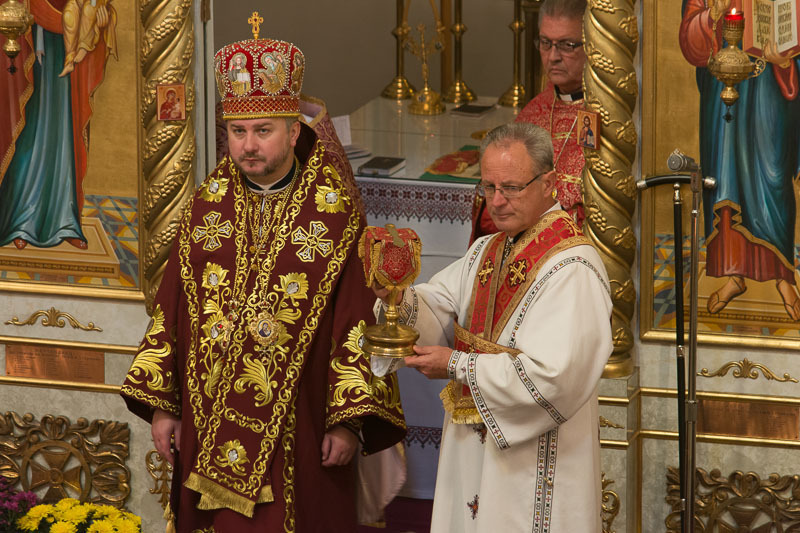 Celebrating the 90th Anniversary of the Ukrainian Orthodox Church in Canada and the election of two new bishops.